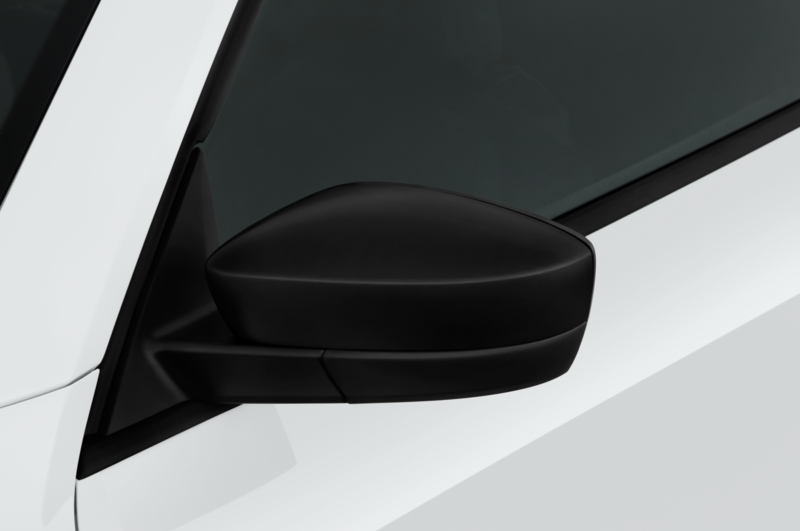 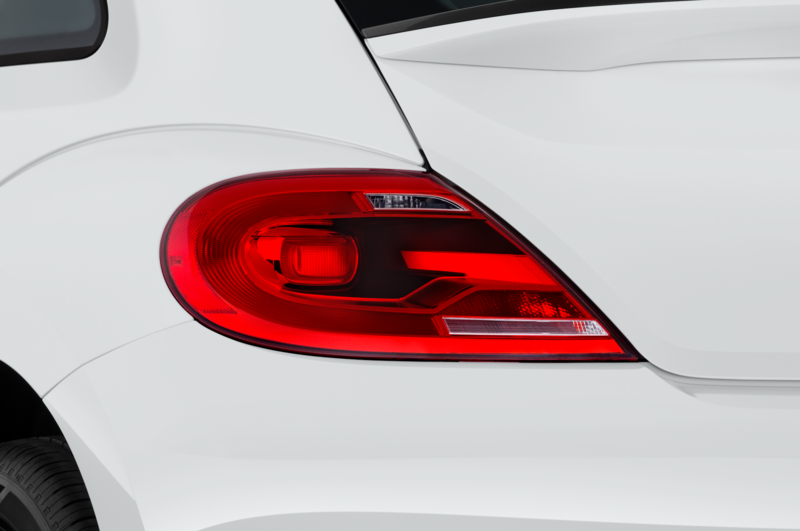 New colors, interior materials, and exterior features showcased. 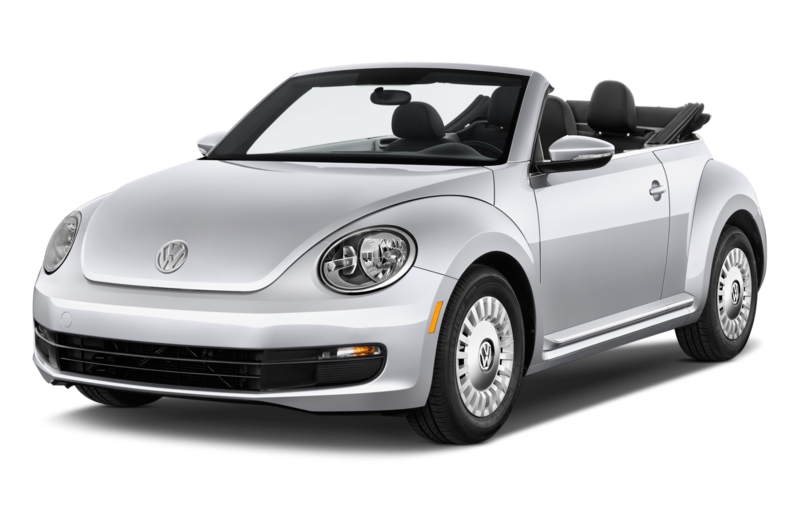 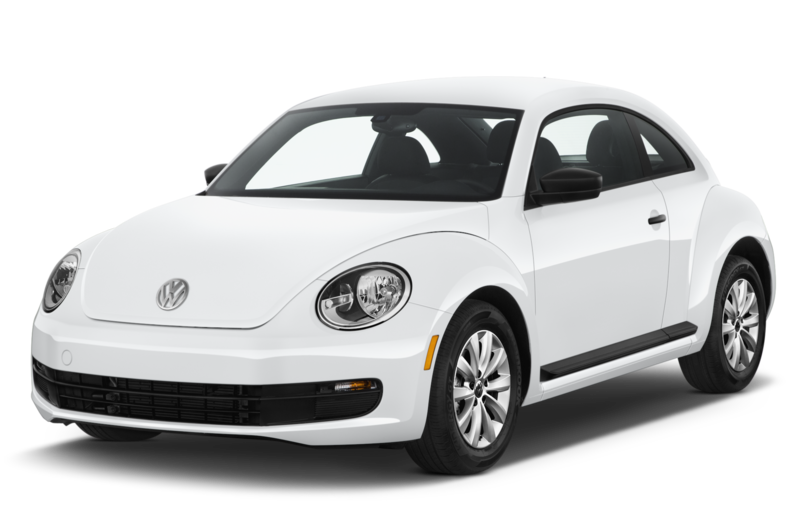 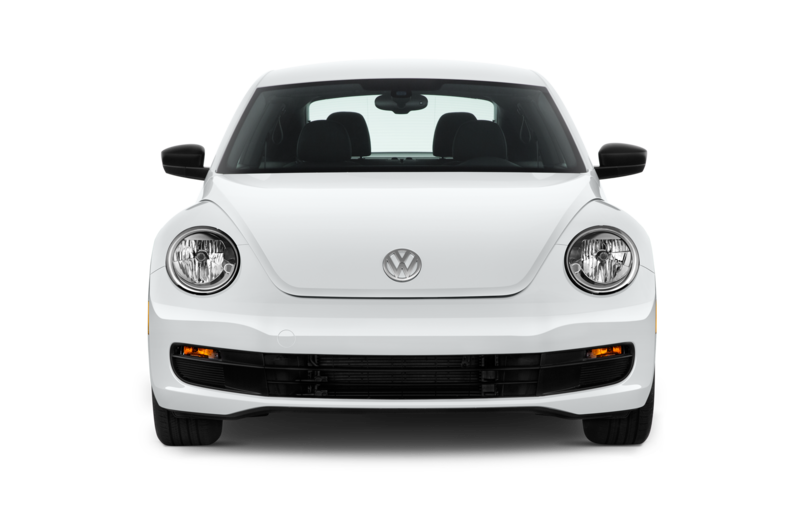 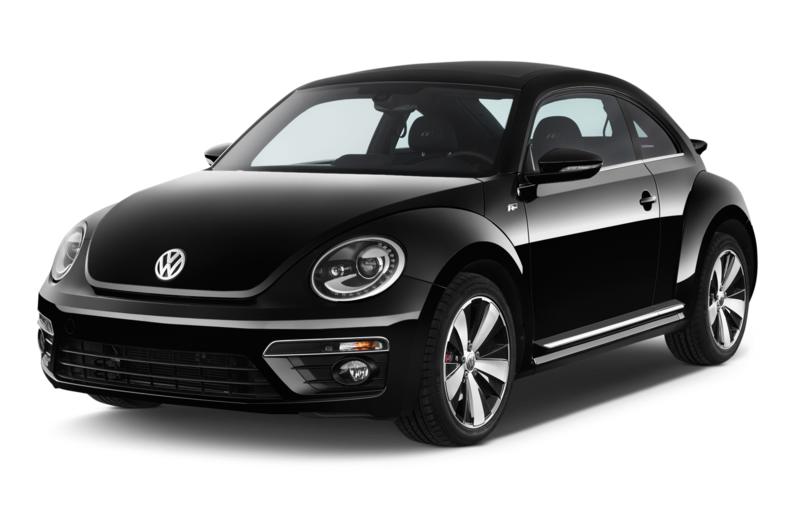 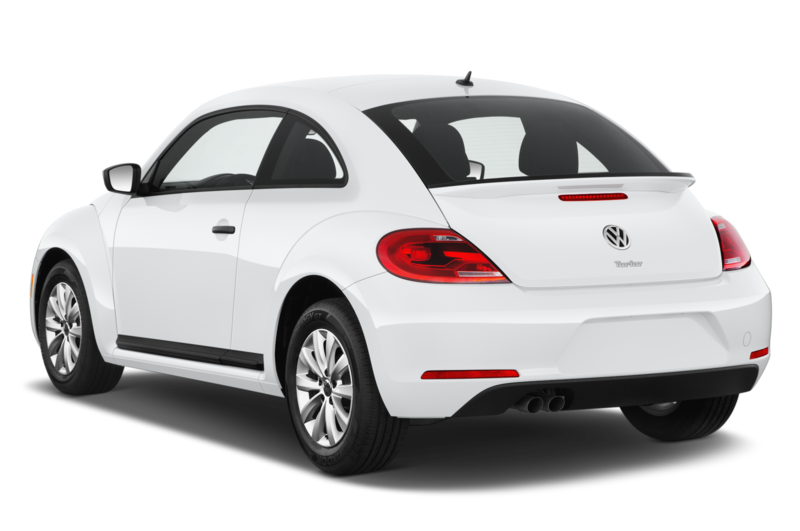 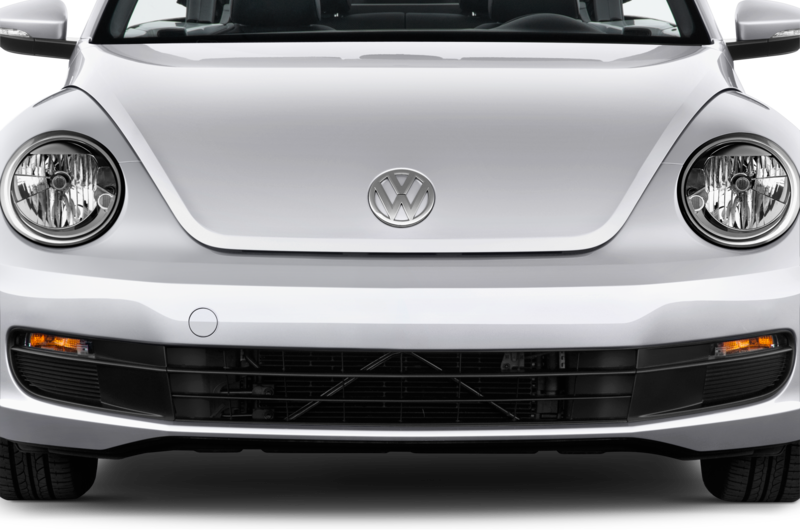 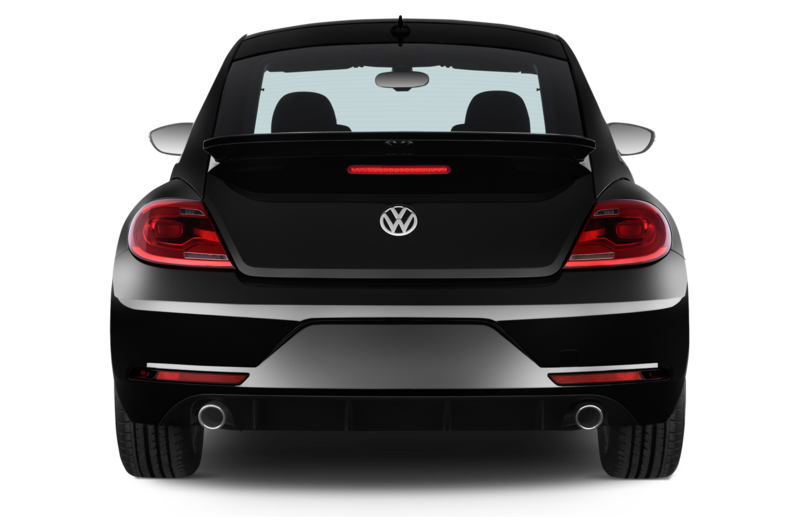 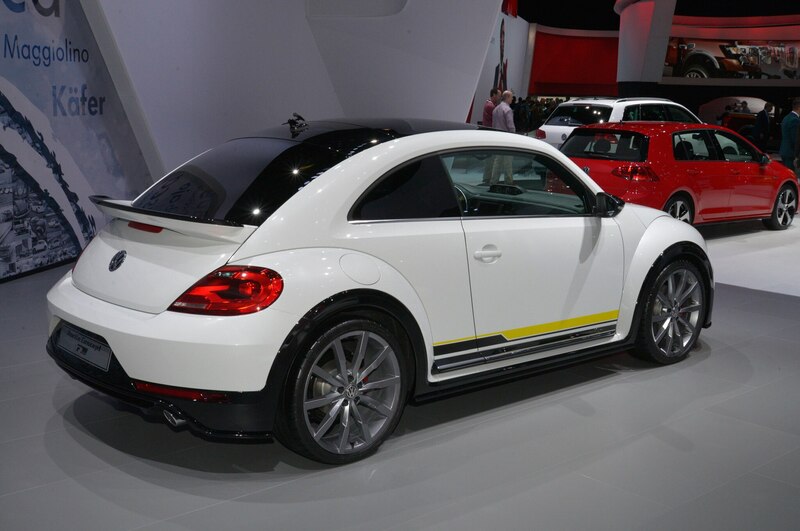 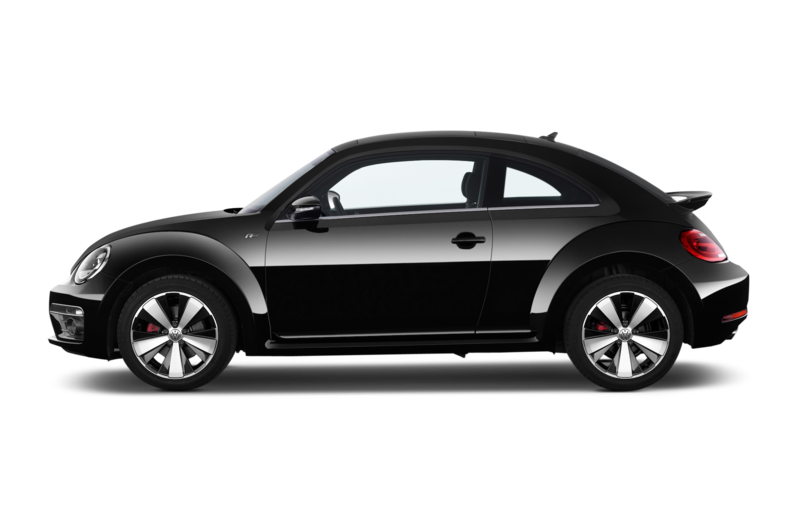 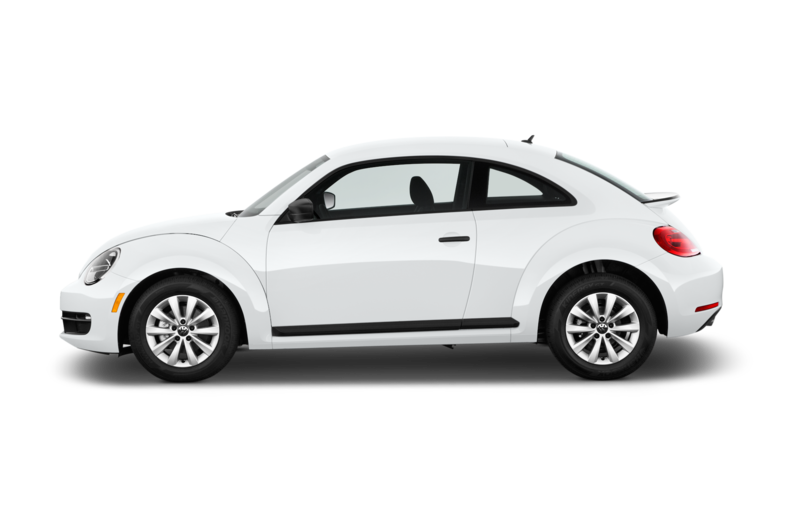 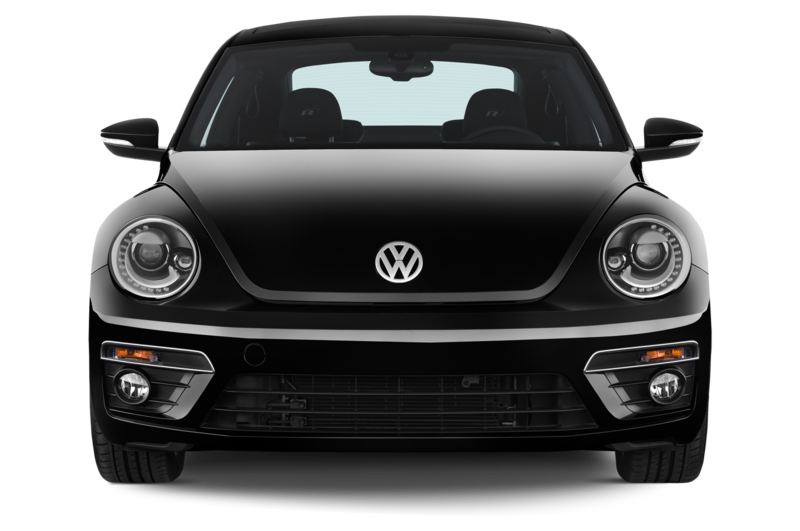 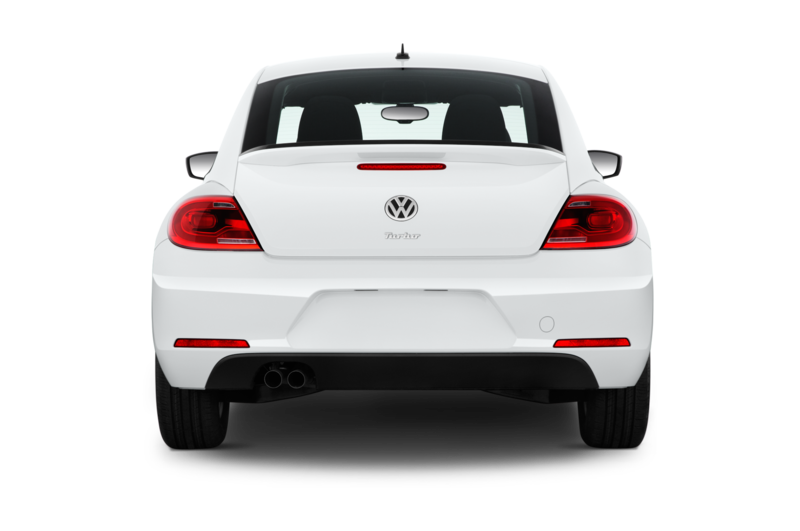 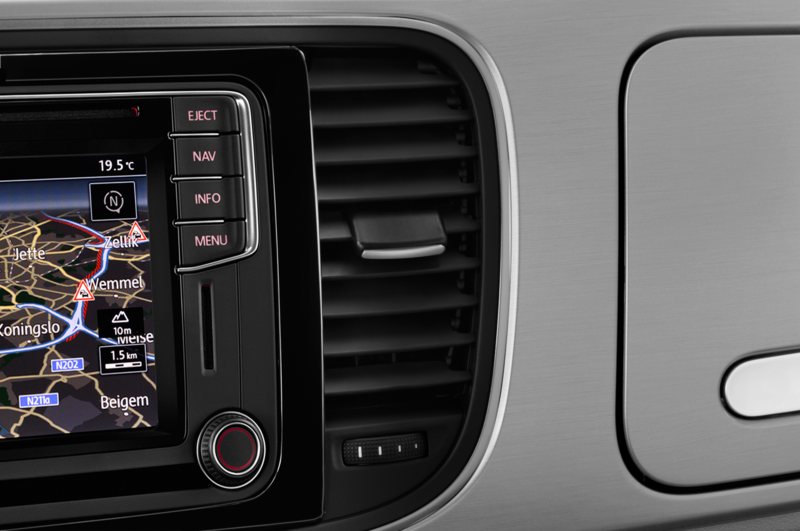 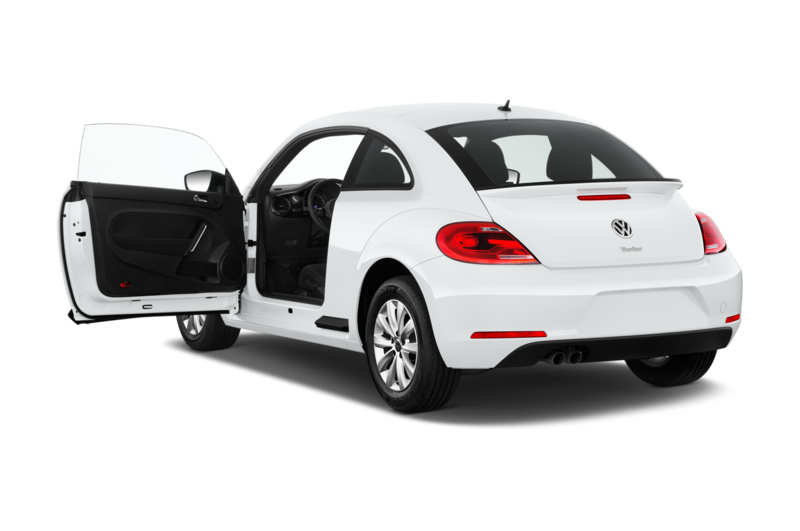 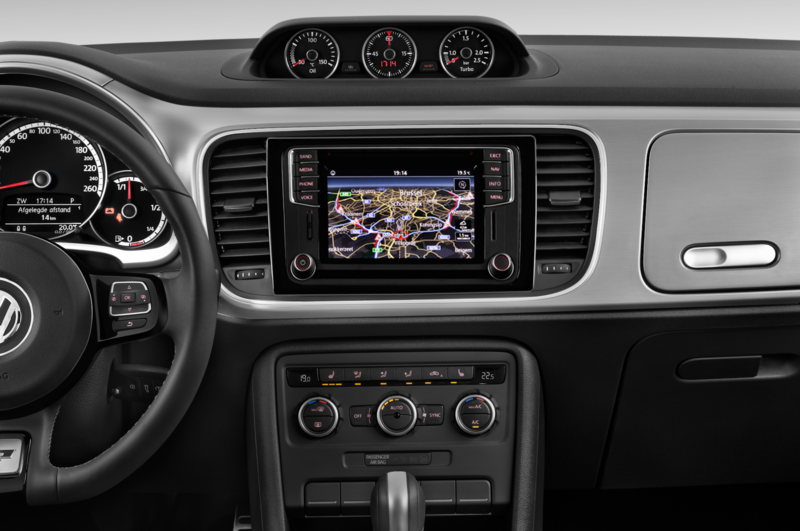 The Volkswagen Beetle has always been the most personality-filled offering in the VW lineup. 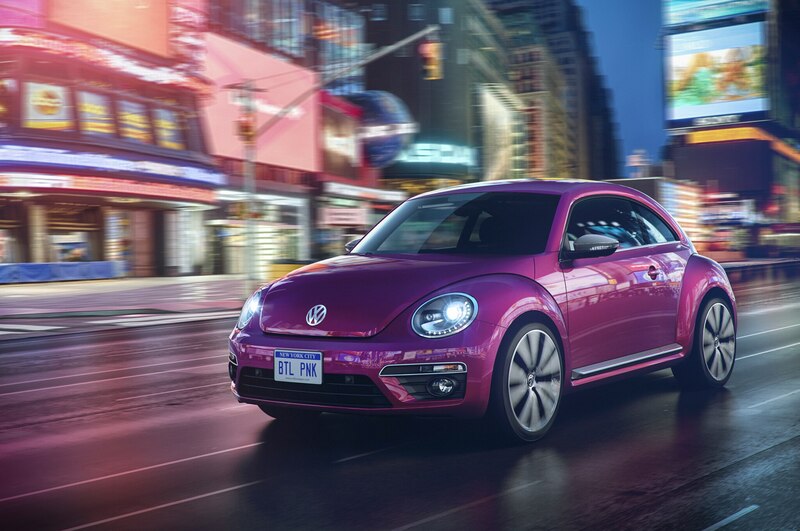 Four new Beetle concepts for the New York auto show, each with their own themes and design, play up this funkiness even more with bright colors and retro elements. 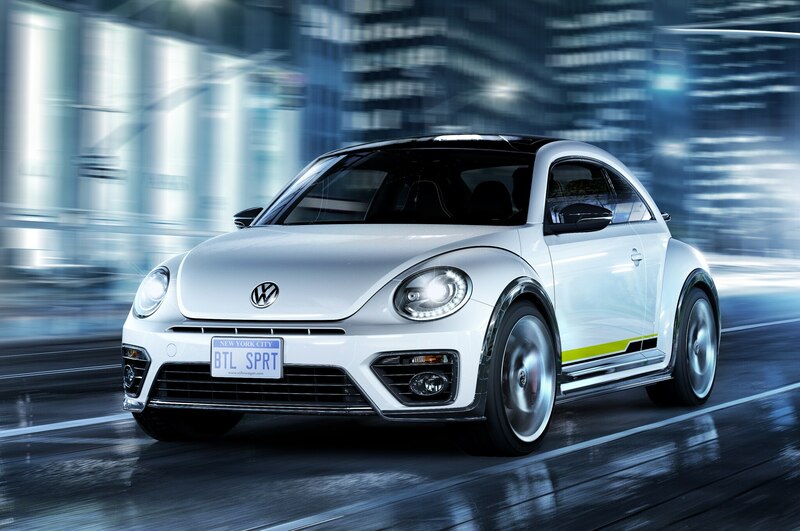 Much like the previous 1950s, ‘60s, and ‘70s Editions of the Volkswagen Beetle, these special-edition cars are starting off as concepts, but could eventually go into production depending on public feedback from the initial debut. 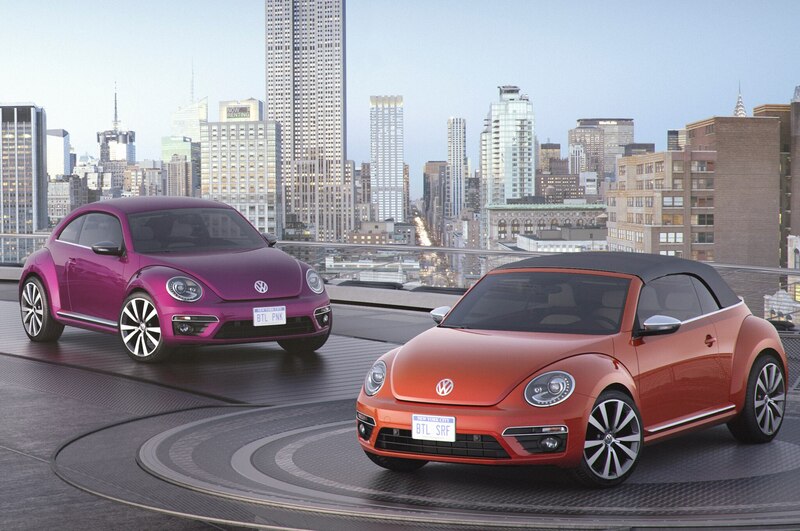 The first concept is a throwback to the wild and design-crazy 1970s. 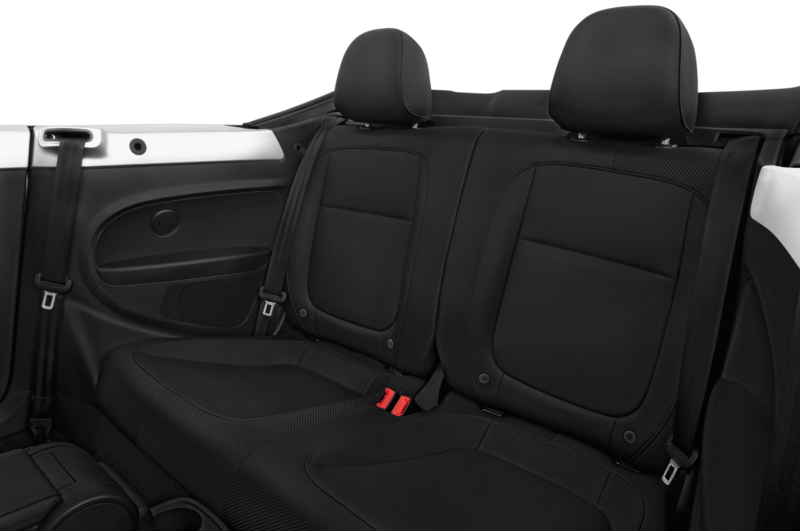 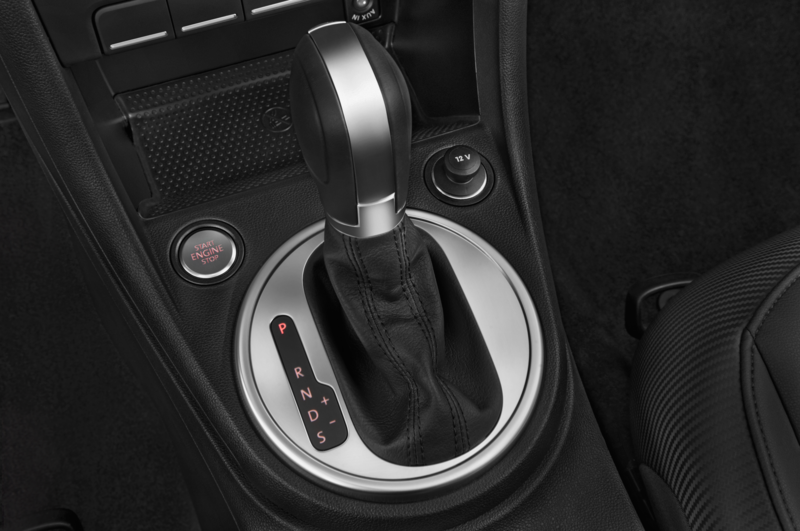 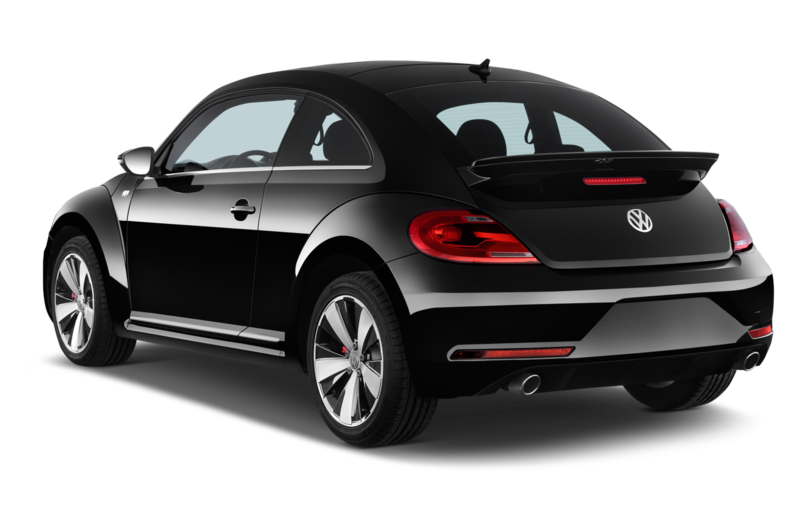 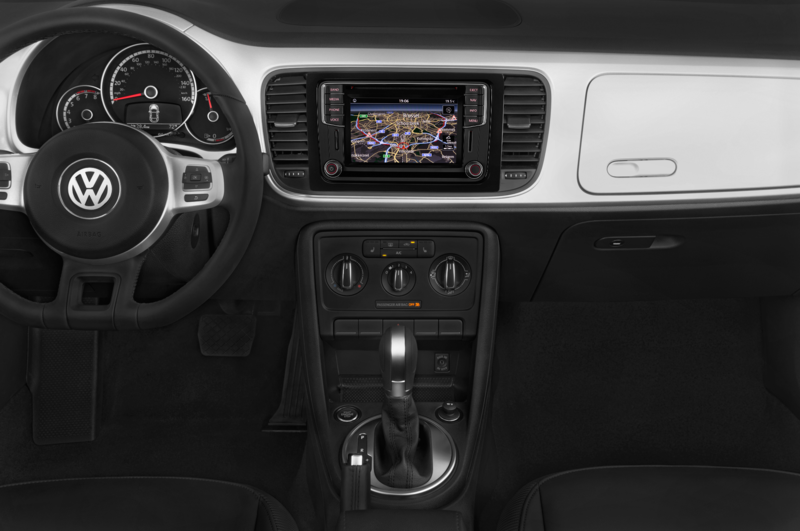 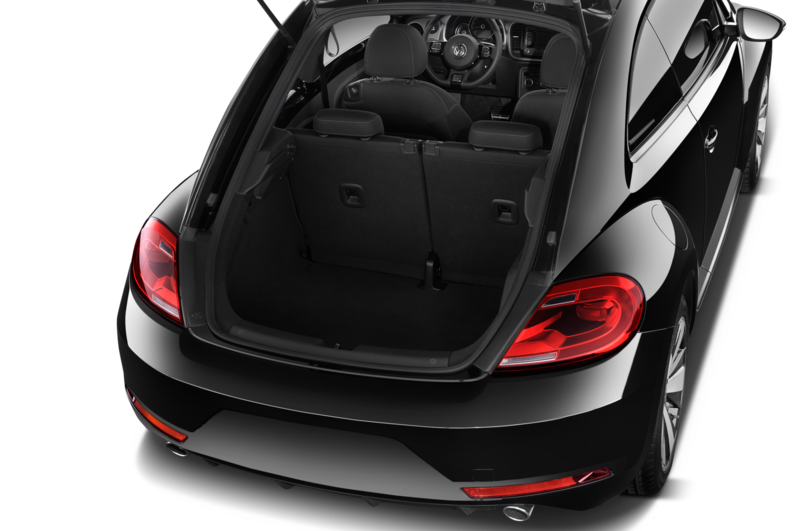 Much like the many denim special edition cars during that strange era, the Beetle Convertible Denim brings in a denim-inspired exterior color scheme, along with extensive use of denim-inspired design on the interior. 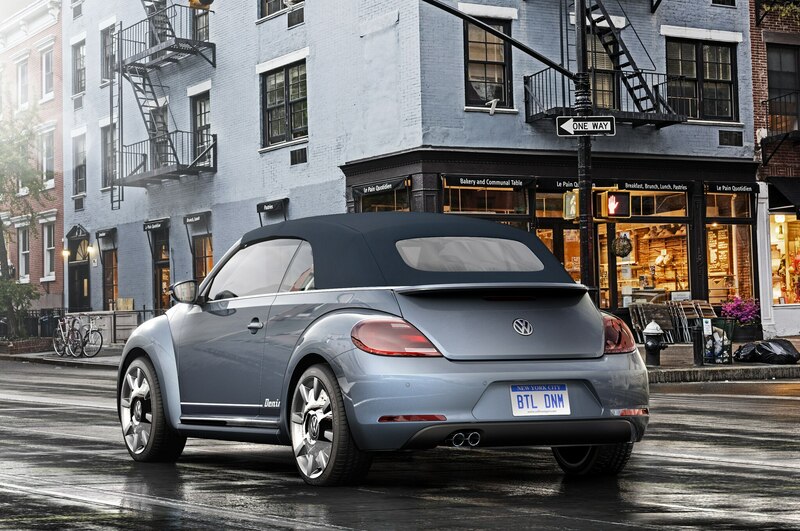 The exterior of the Beetle Convertible Denim is painted in Stonewash Blue Metallic, with the mirror caps, side skirts and body moldings finished in gray. 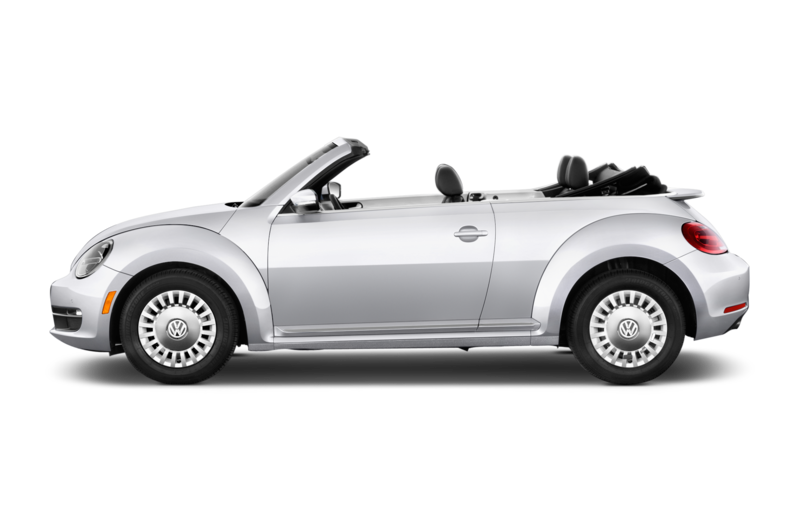 The power-folding softtop is a dark blue textured fabric and contrasts with the 18-inch chrome wheels. 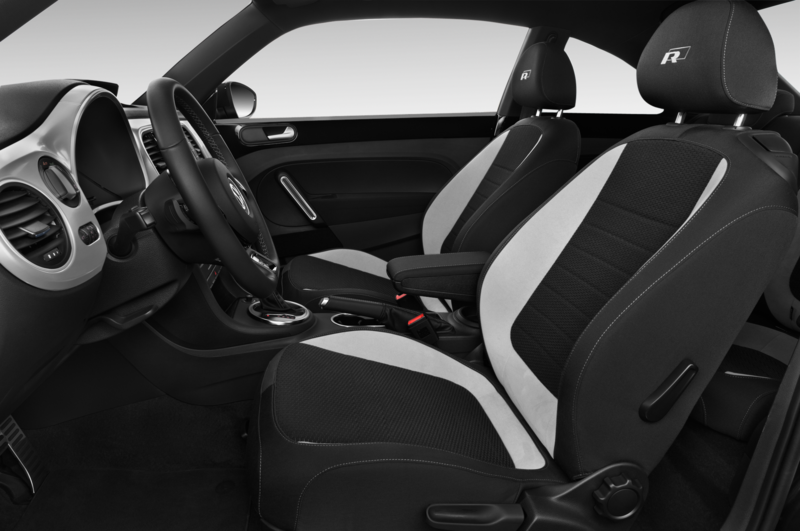 Inside, the interior gets its share of denim-inspired features as well. 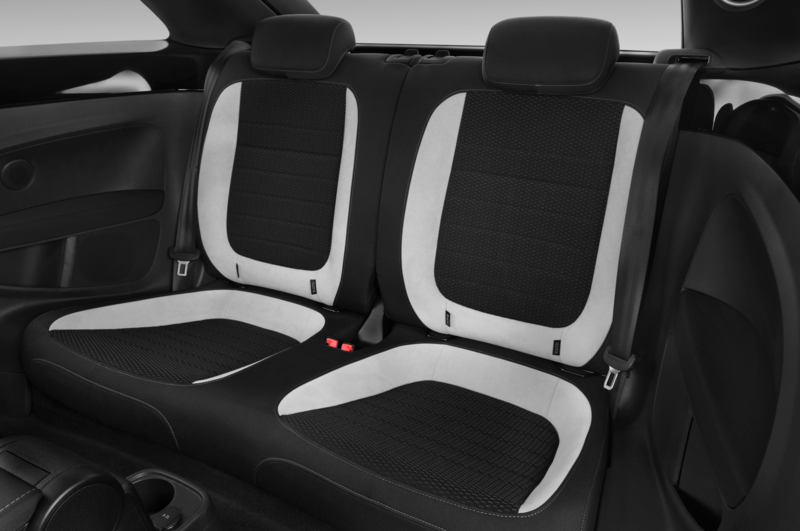 The standard sport seats have been recolored with blue leatherette on the outside of the seat, with the interior seat cushions and seat bottom upholstered in light blue cloth. 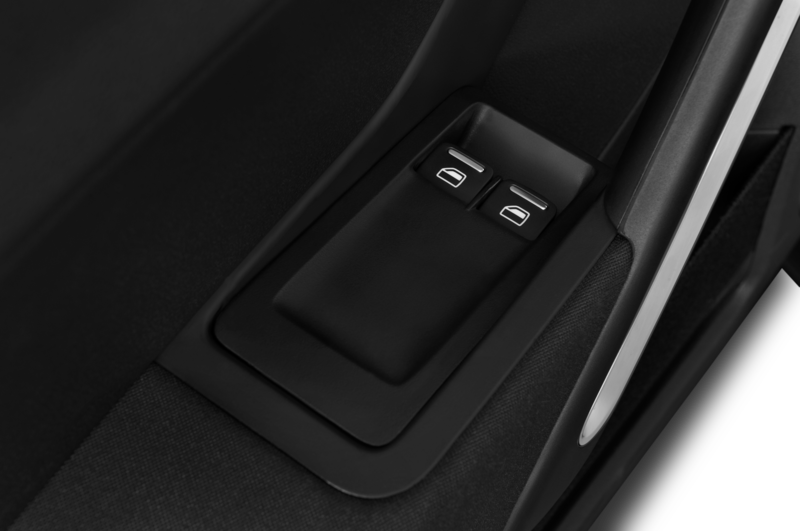 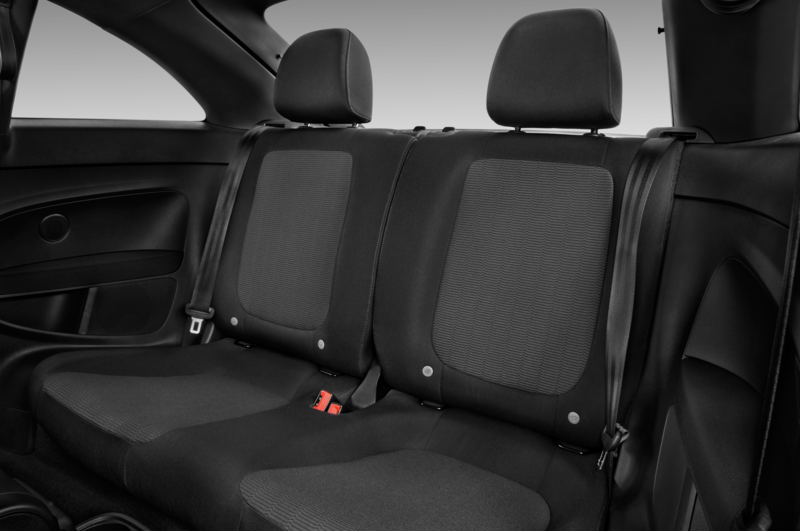 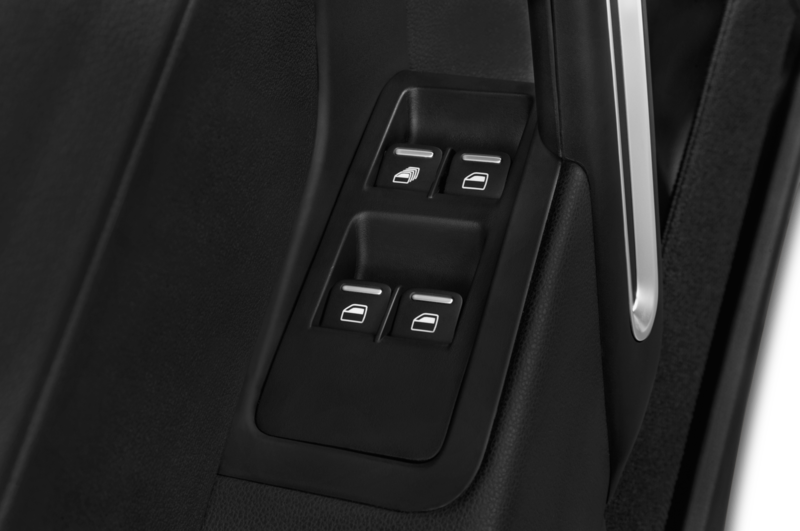 Denim-like pockets are added to the side and rear of the seats as well. 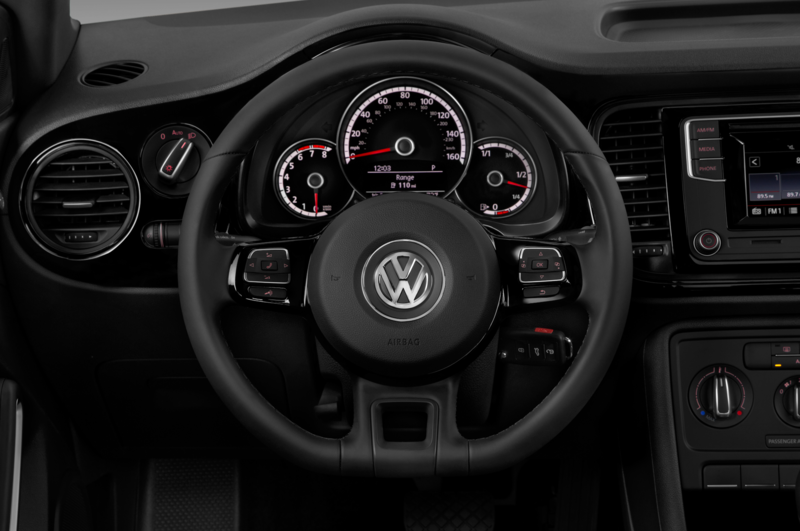 The concept adds a brushed matte aluminum dashpad, exterior paint color-matched door shoulder panels, contrasting blue door armrests, and white stitching on the steering wheel and shifter, along with a front center armrest upholstered in blue fabric with contrasting stitching. 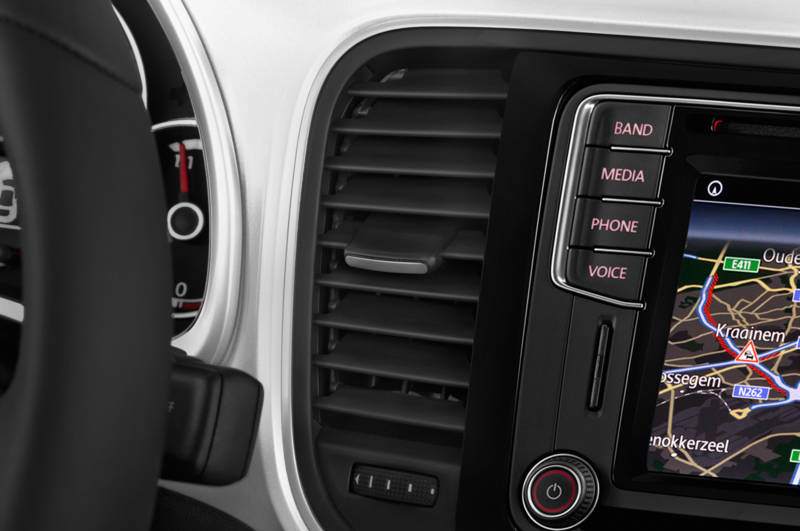 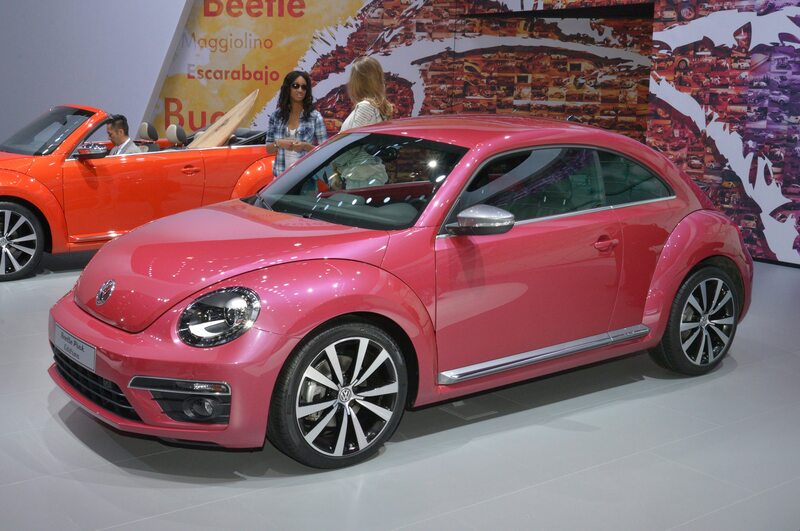 The second concept is the Beetle Pink Color concept. 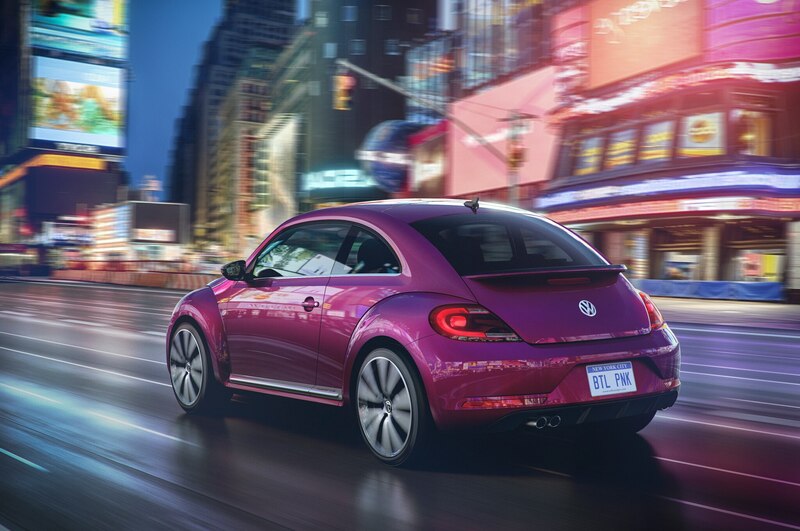 As the name suggests, the overall color scheme of this Beetle is pink; more specifically, Pink Metallic. 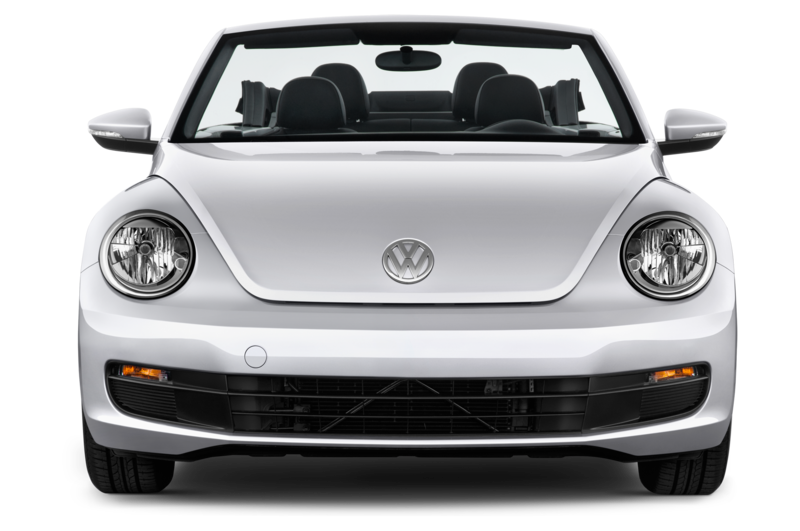 The eye-catching exterior paint contrasts well with the gray mirror housings and side body molding, along with its front and rear R-Line design bumpers. 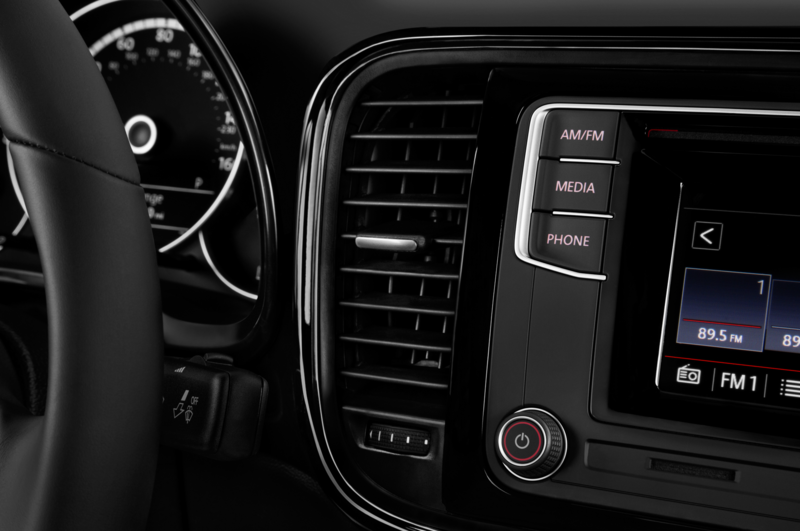 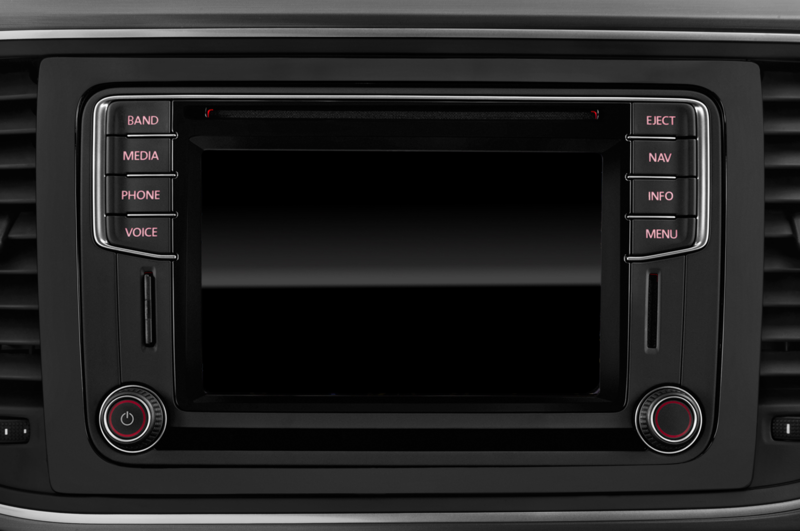 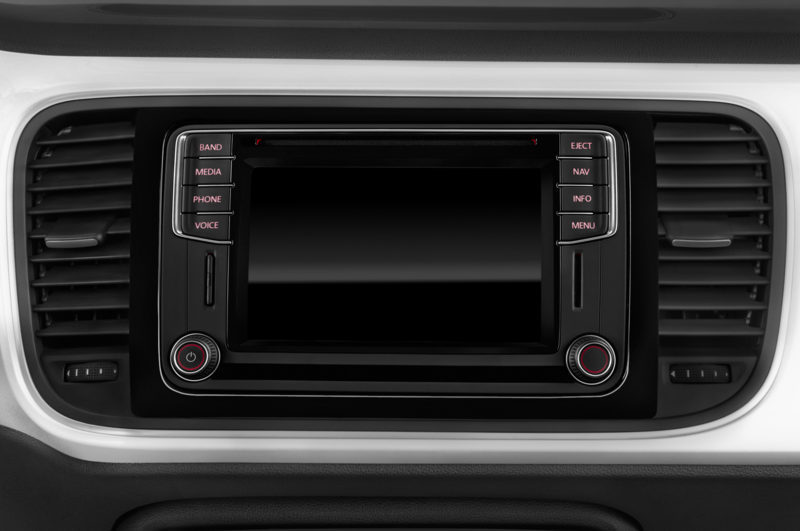 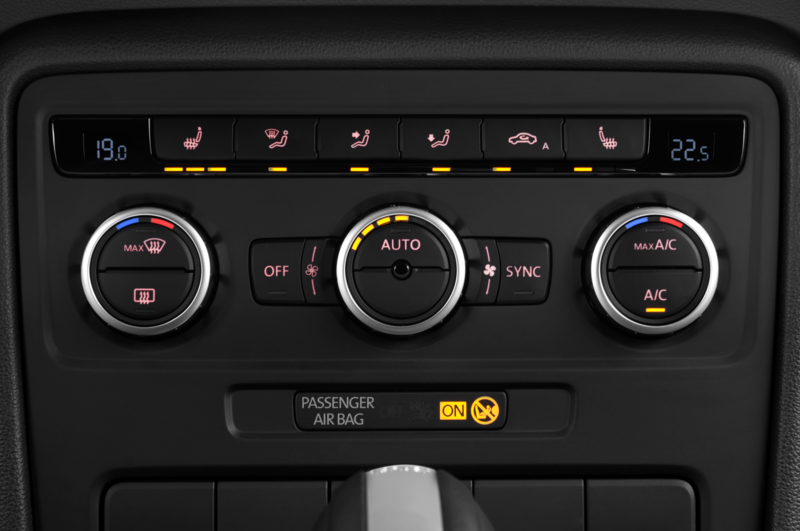 The interior of the concept is part of the pink theme as well. 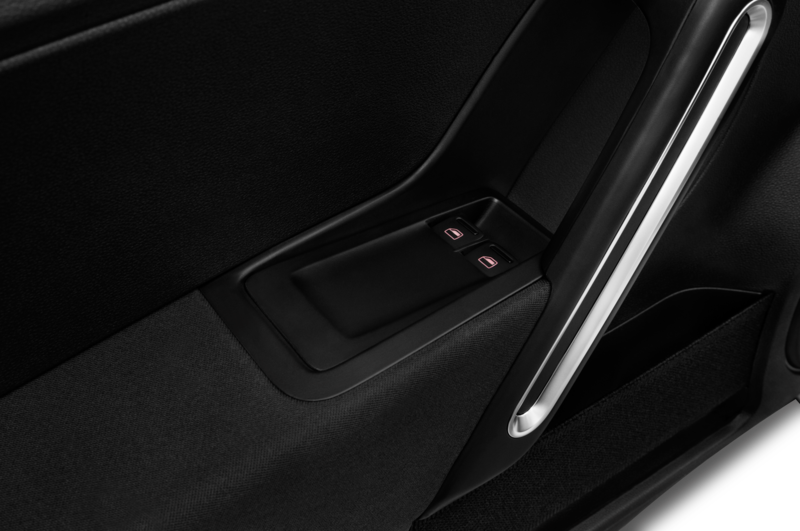 The door shoulder panels, air vent surrounds, steering wheel trim and stitching, shift knob stitching, and floormat stitching is all done up in matching Pink Metallic. 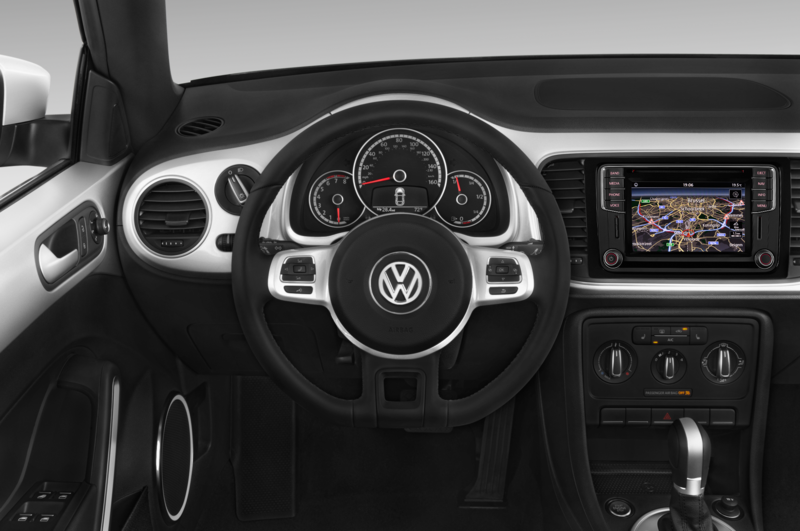 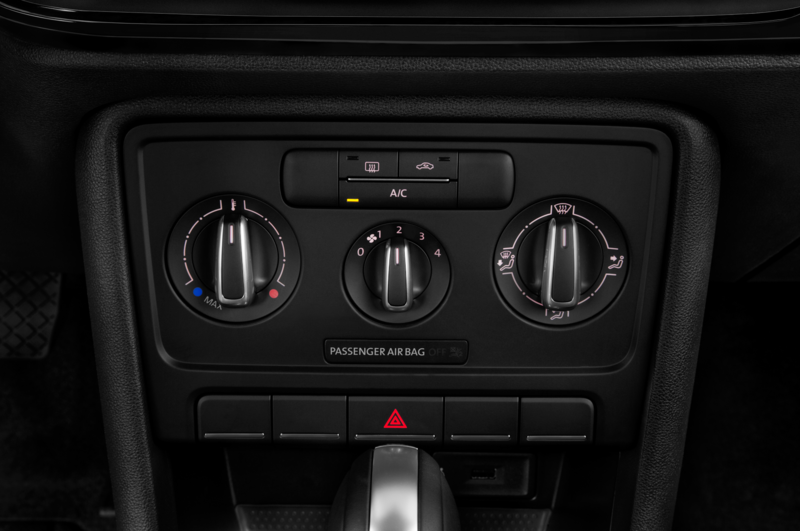 The rest of the cabin is black with a smattering of brushed aluminum accents. 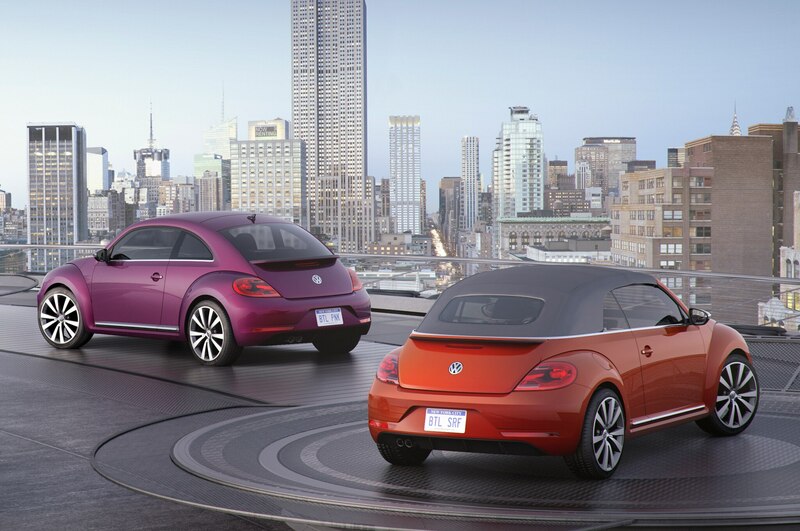 The Beetle Convertible Wave concept’s paint color is a little easier to swallow than the Metallic Pink paint. 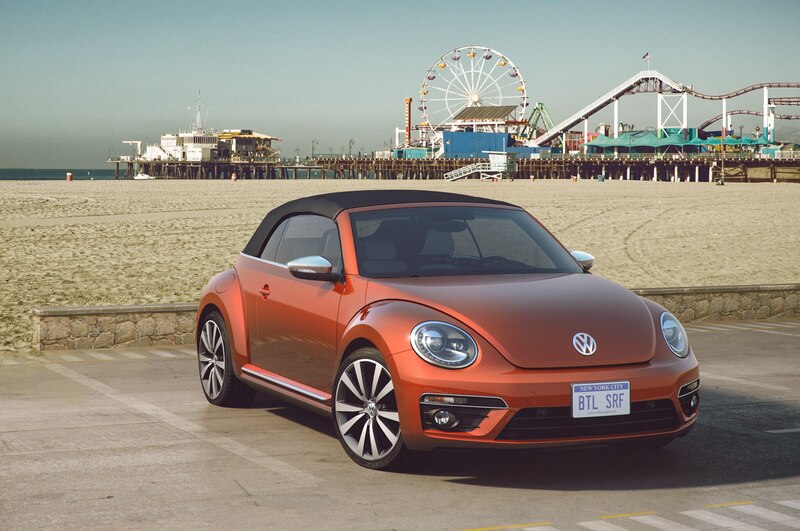 Clad in Habanero Orange Metallic, the Wave concept is meant for beach-goers, with a surfboard-style wooden dash pad offset by classic houndstooth pattern seats. 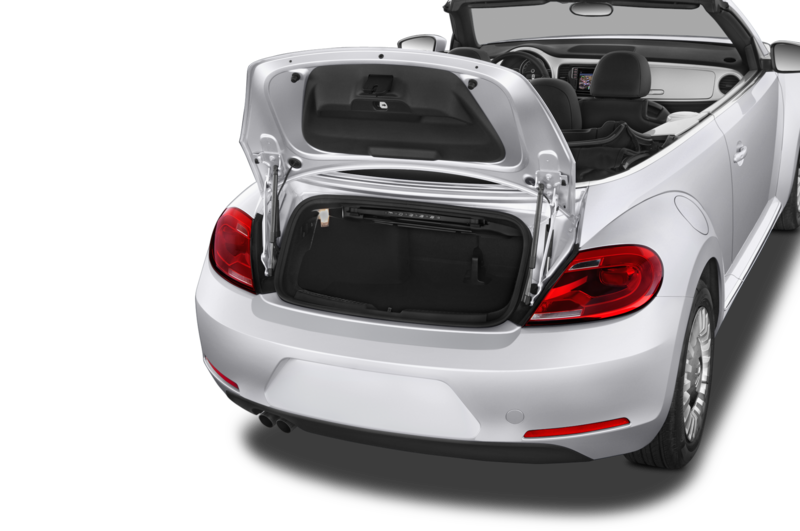 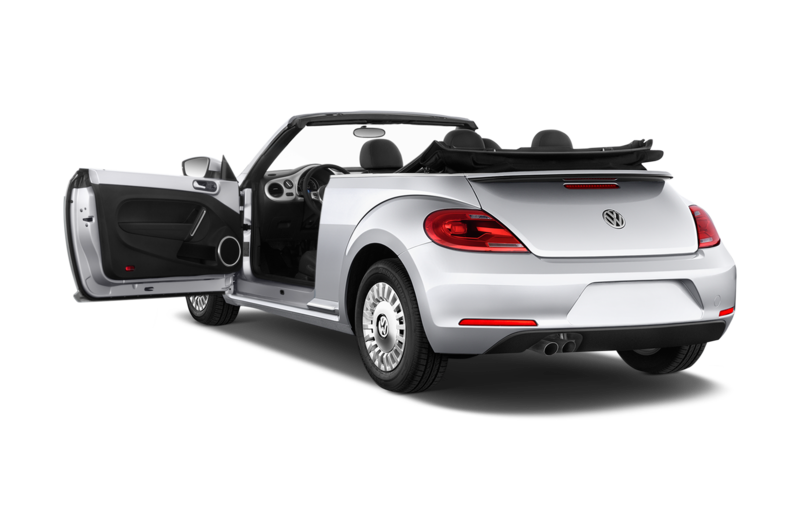 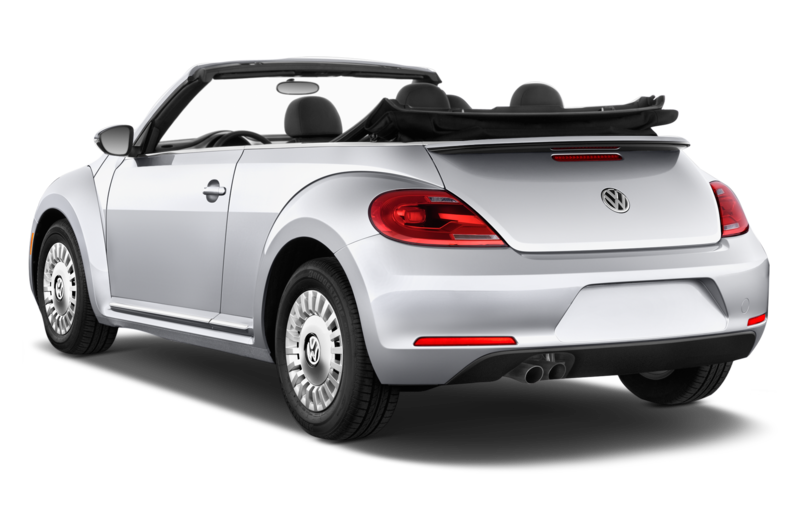 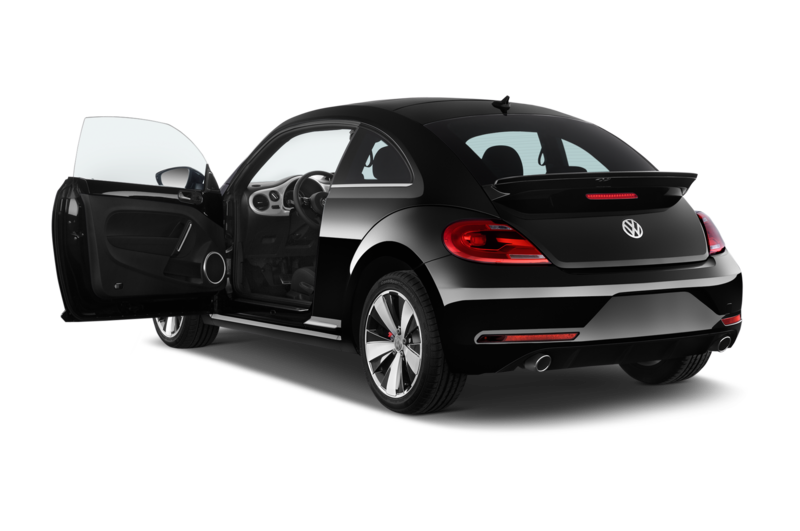 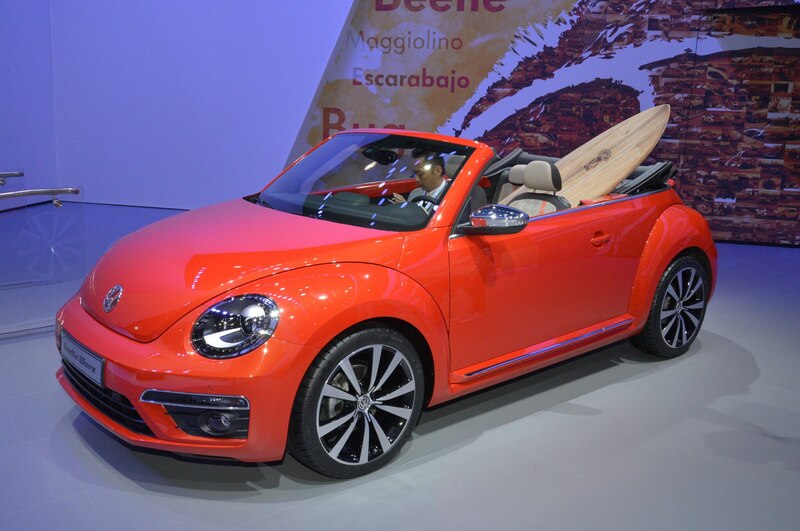 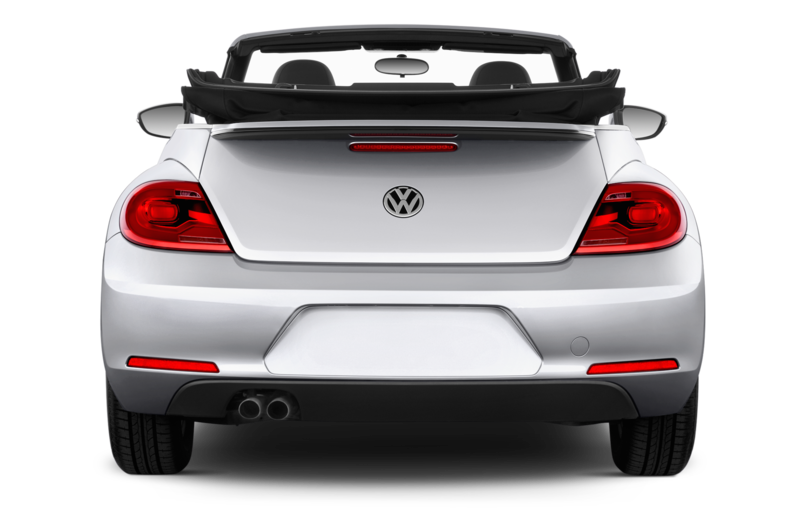 The Beetle Convertible Wave is in the same vein as the Beetle Dune concept, which debuted at the 2014 Detroit auto show. 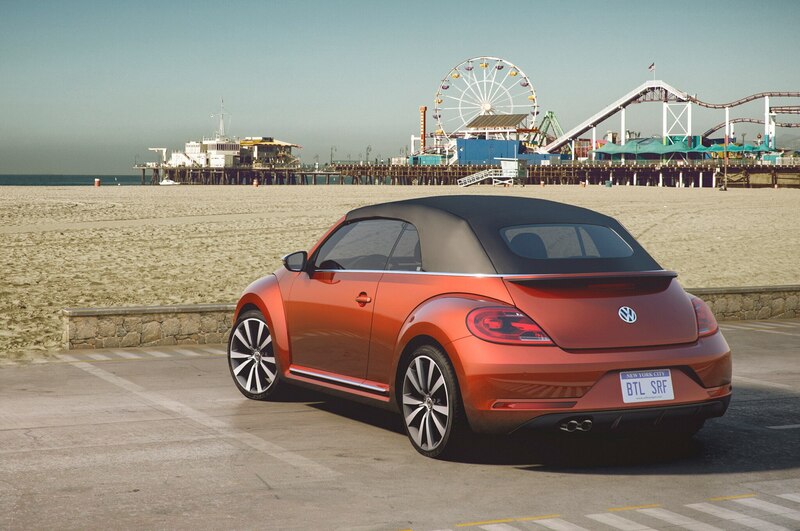 The Dune, like the new Wave, is a fun-in-the-sun focused Beetle, with a raised ride height and special rugged body cladding. 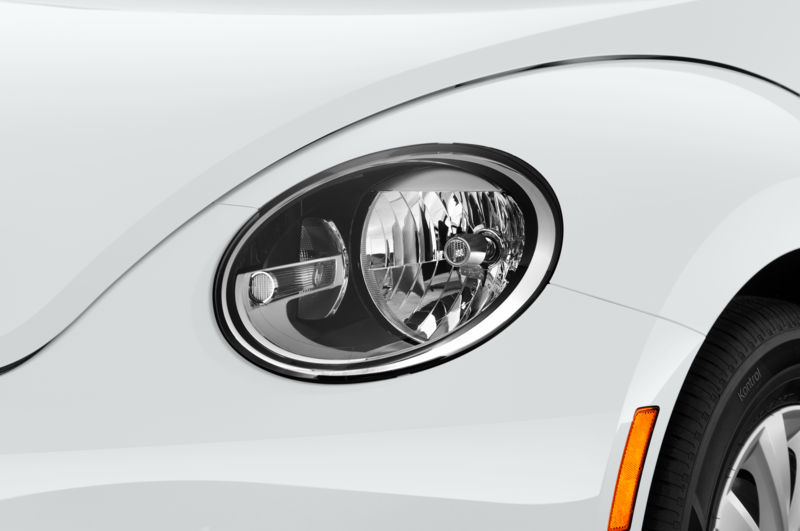 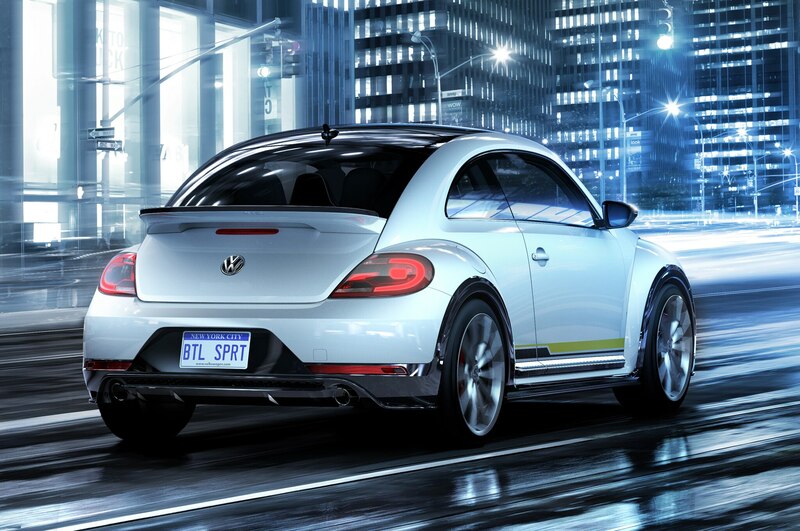 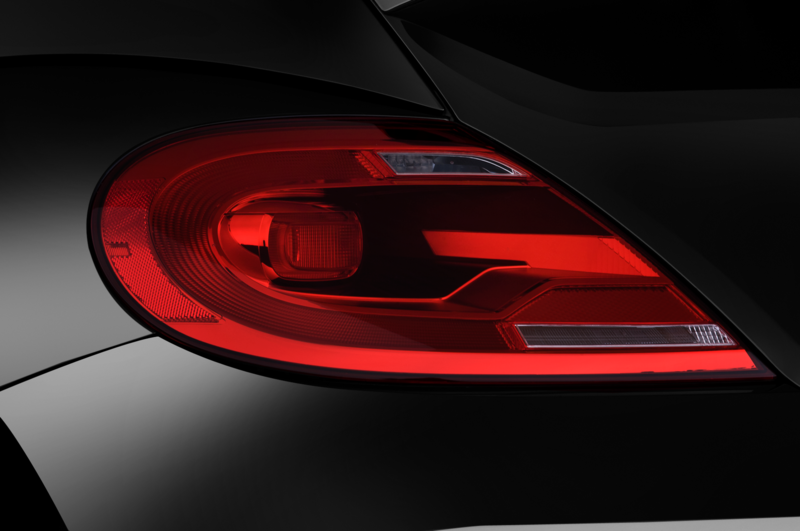 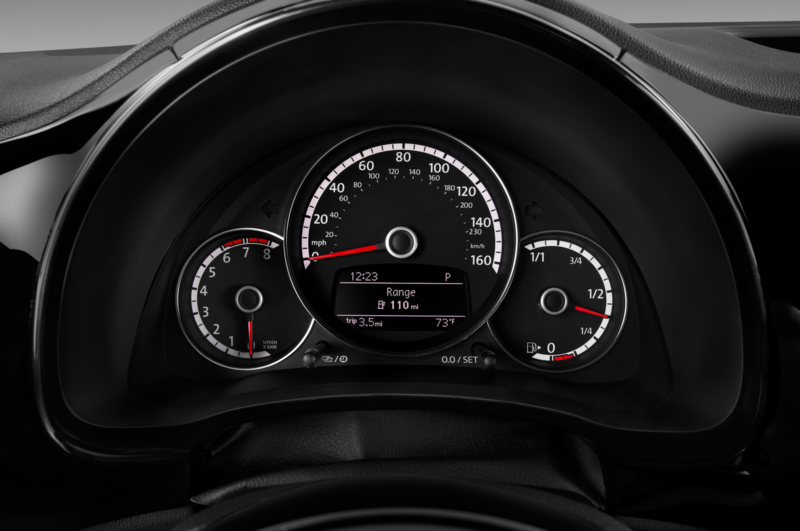 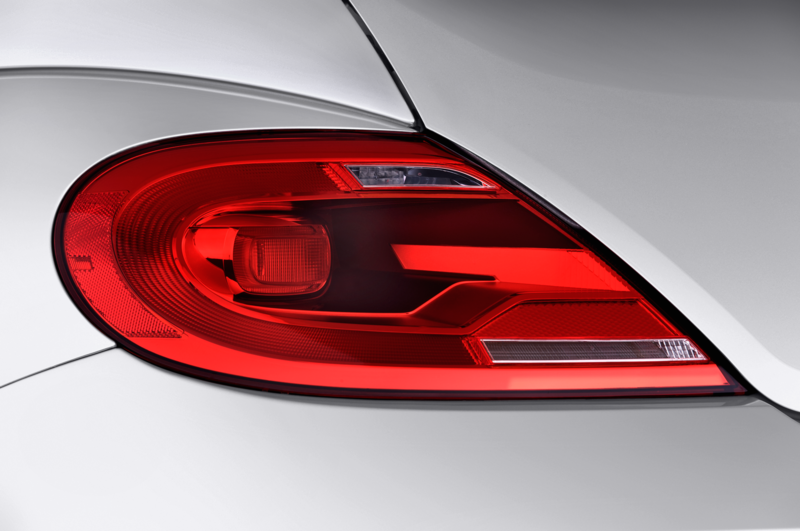 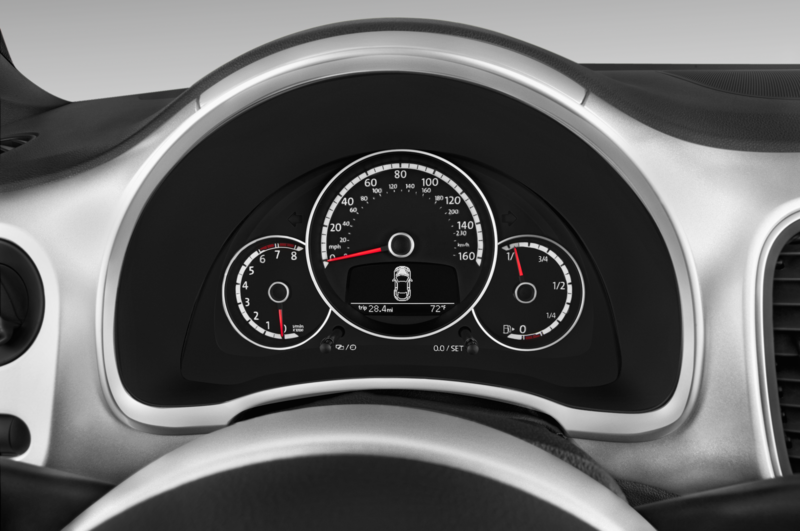 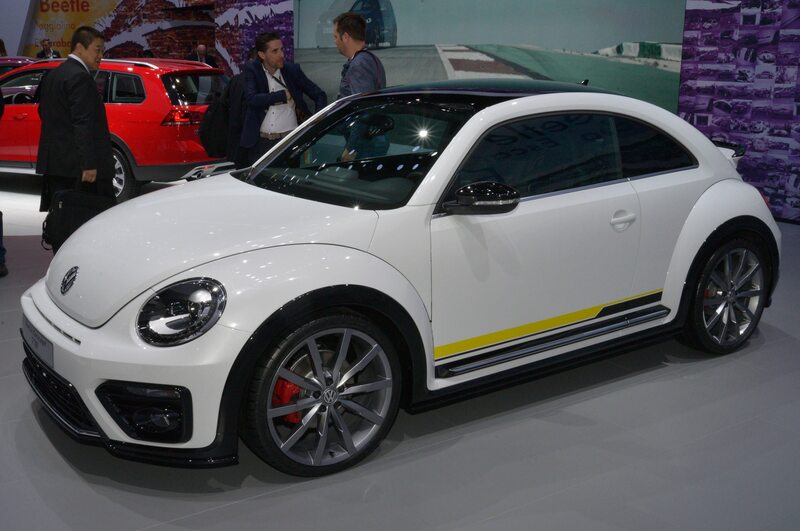 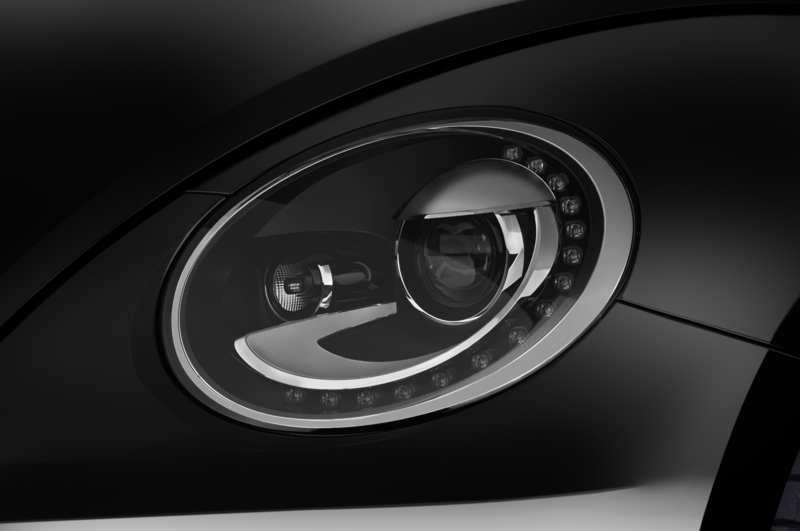 Rounding out the new Beetle concepts is the performance-focused Beetle R-Line concept. 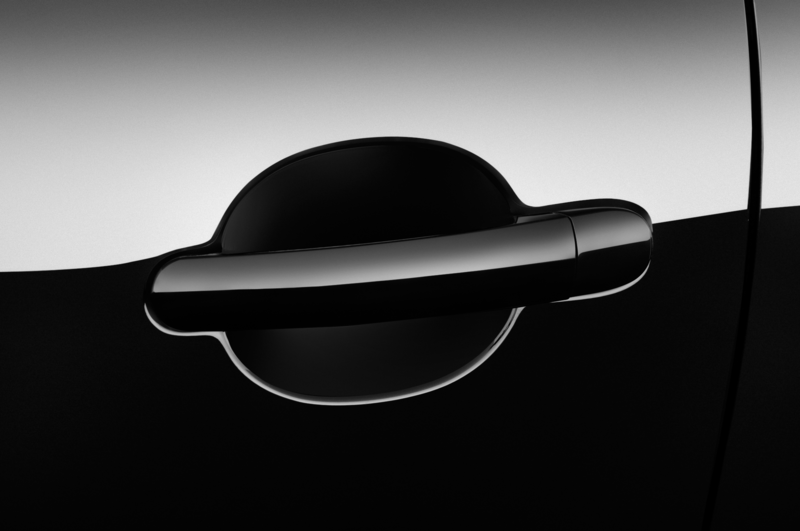 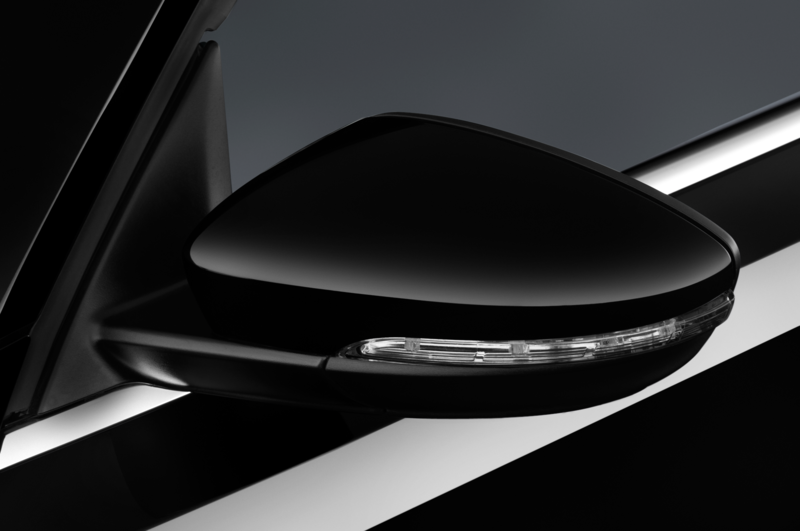 The sporty concept is covered in Onyx White Pearl, with gloss-black side moldings that extend down the length of the car. 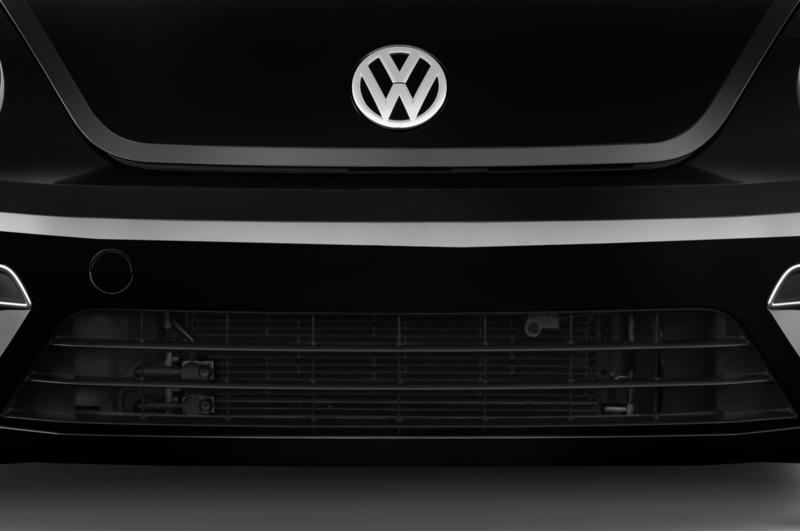 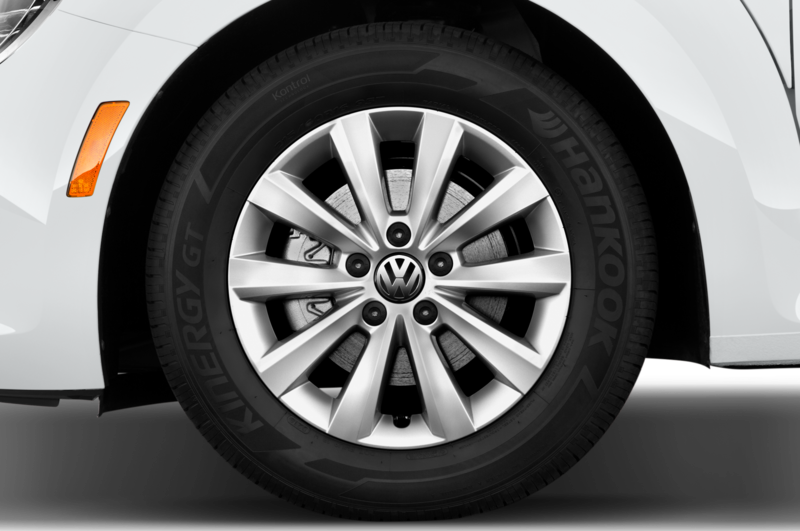 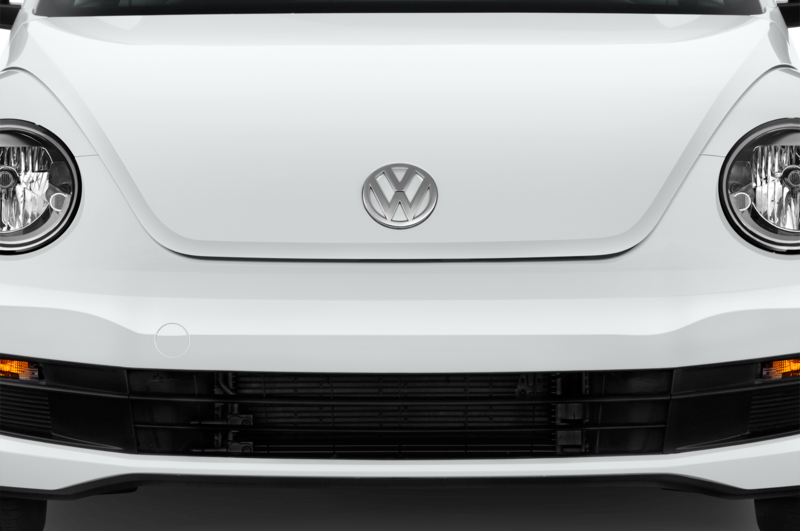 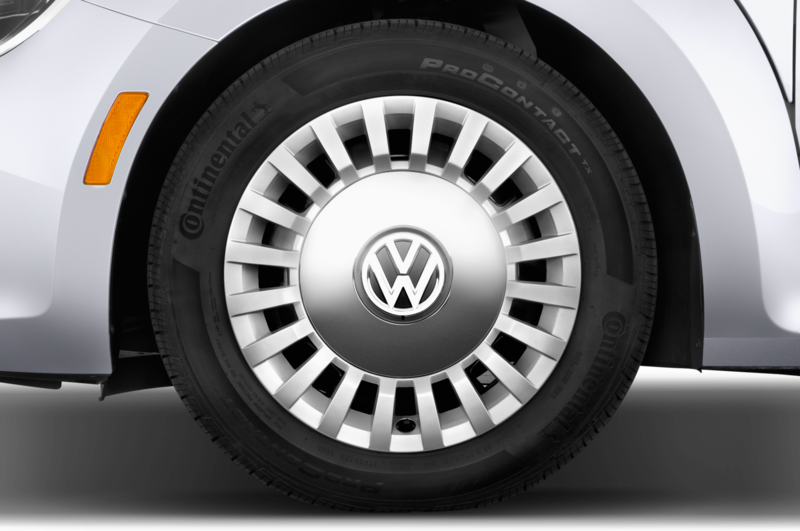 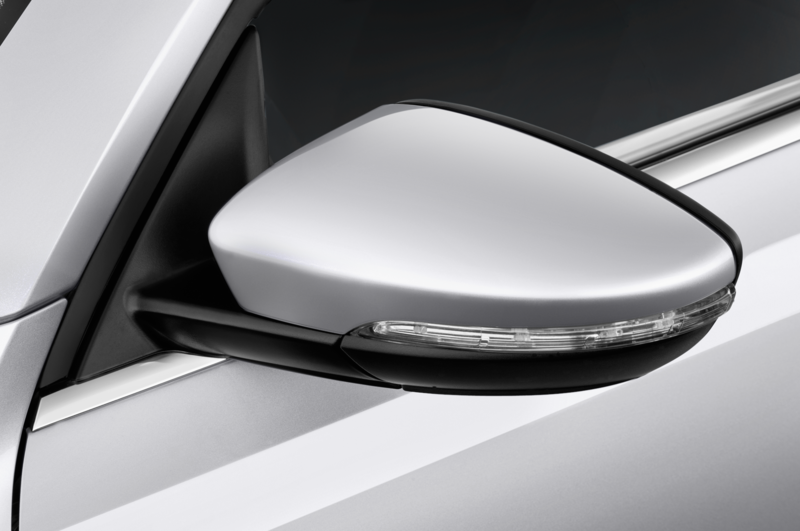 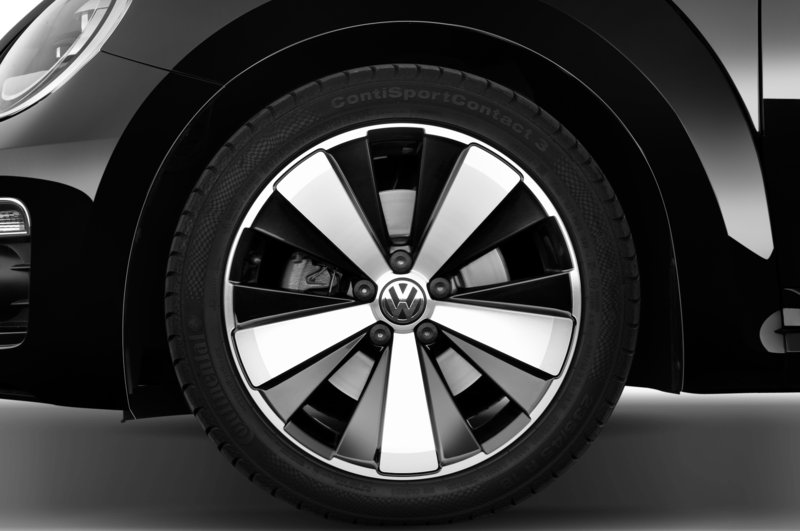 The R-Line features new 20-inch aluminum-alloy wheels, along with gloss black mirror caps and a painted rear diffuser. 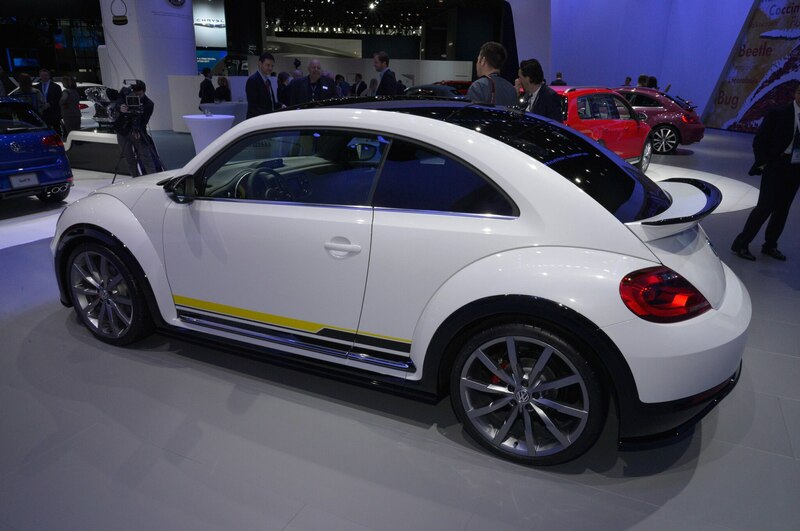 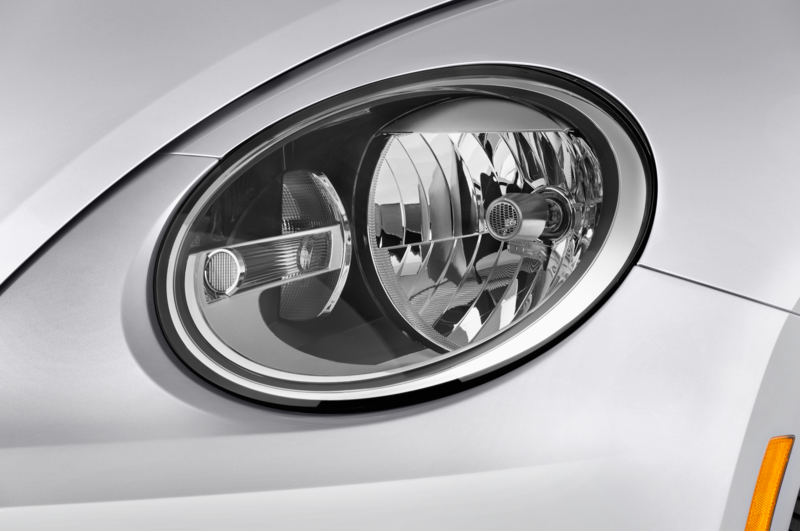 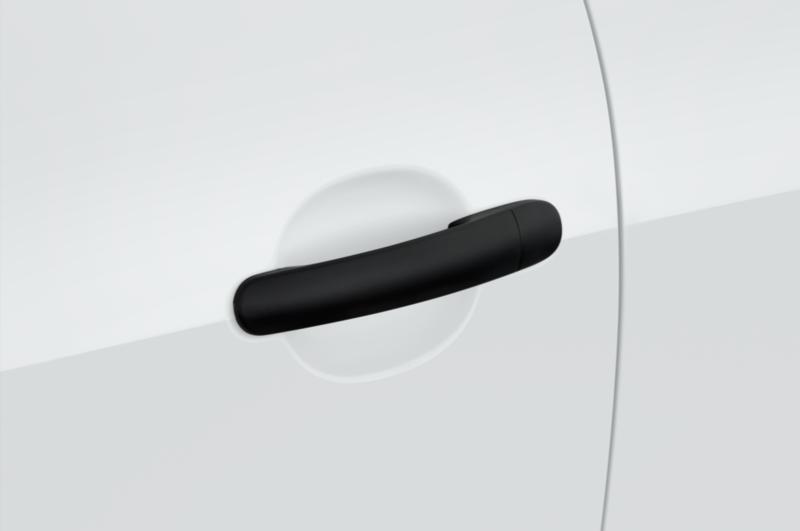 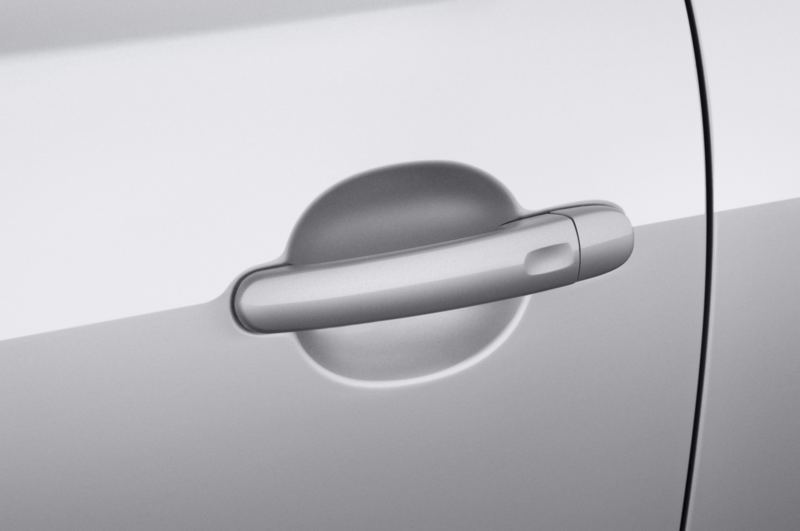 Overall, the R-Line concept is 0.6-inches wider than the standard production Beetle. 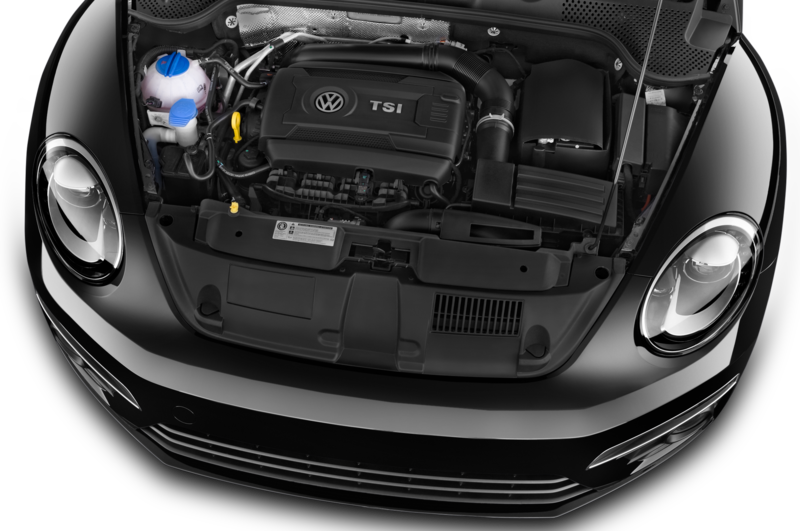 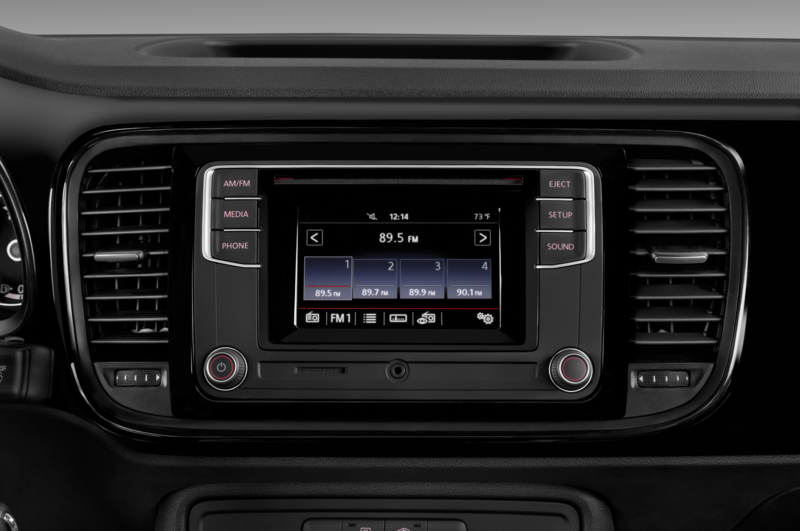 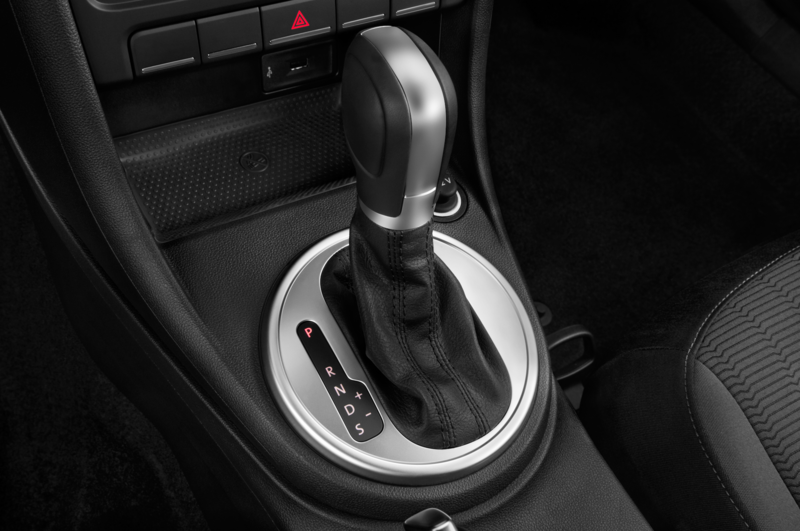 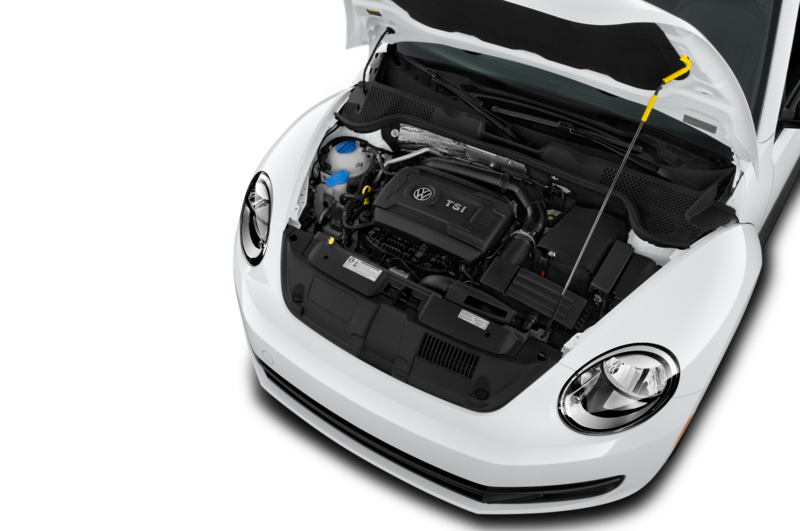 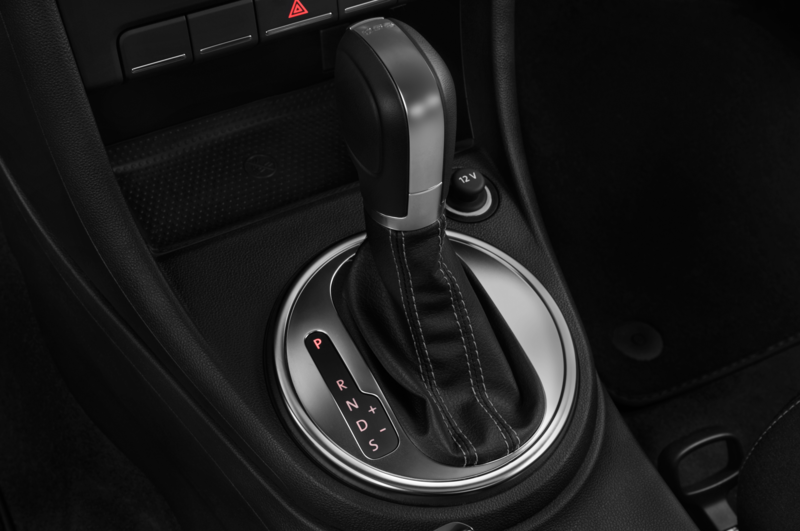 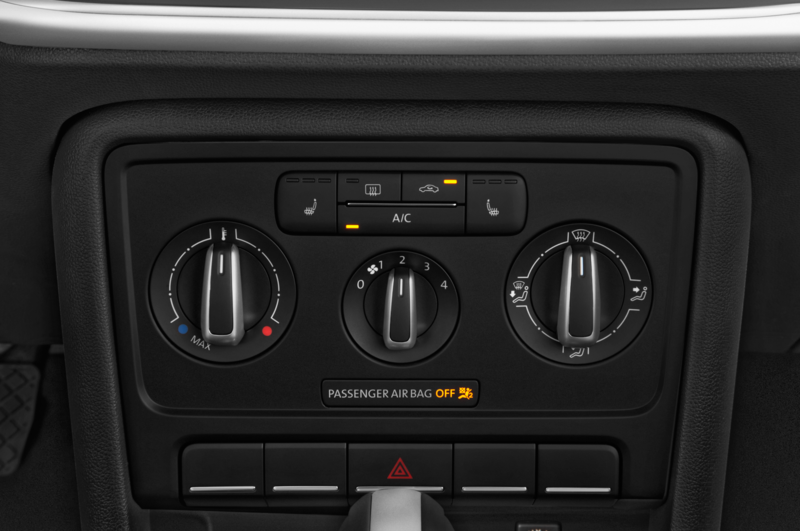 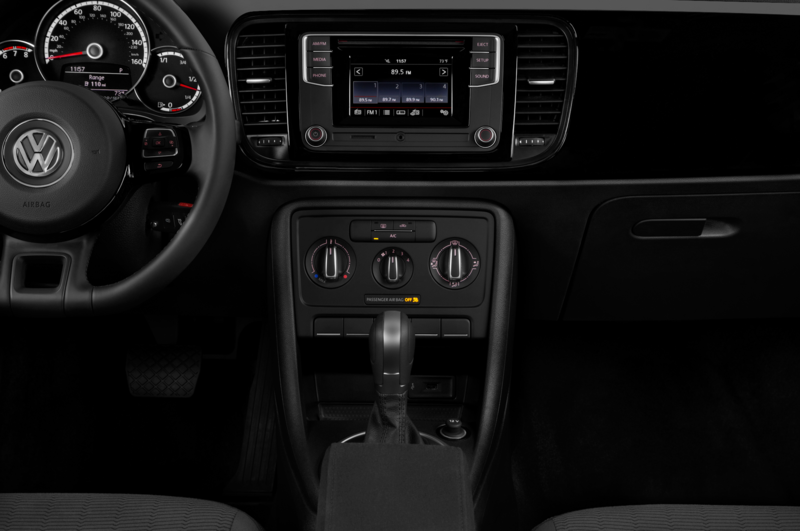 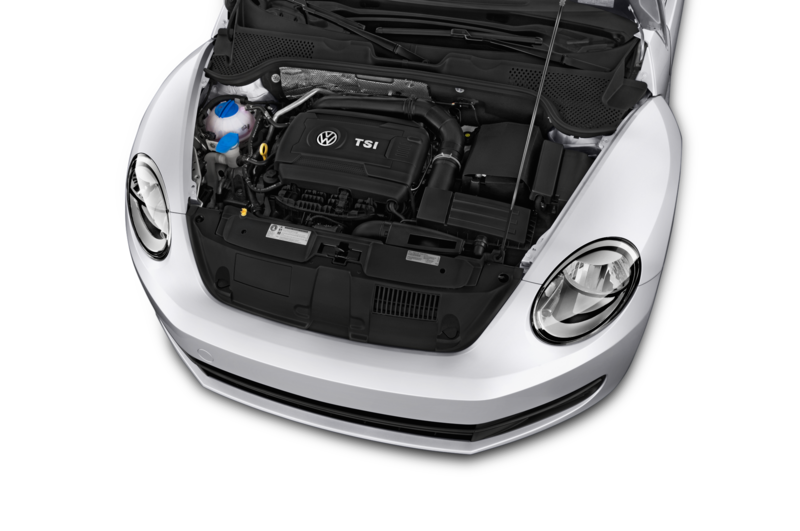 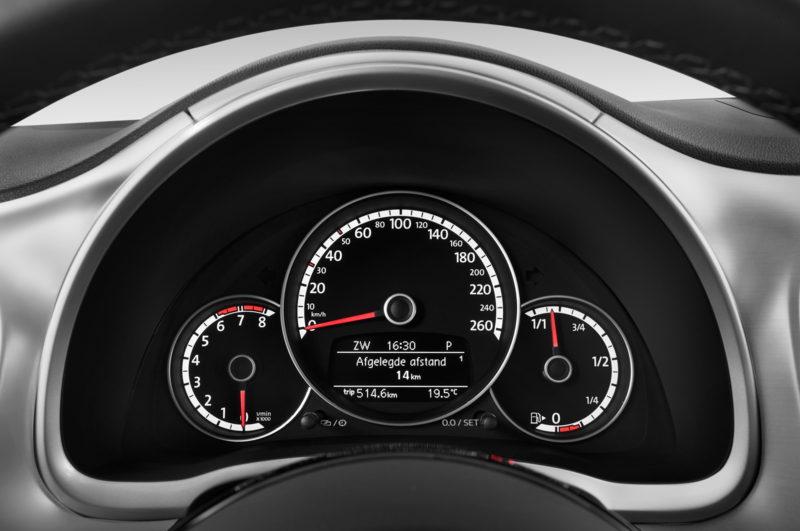 Under the hood, the R-Line is powered by a 217 hp 2.0-liter turbocharged four-cylinder from the VW Golf GTI, giving it a boost in performance over the normal Beetle’s 200 hp 2.0-liter turbocharged four-cylinder. 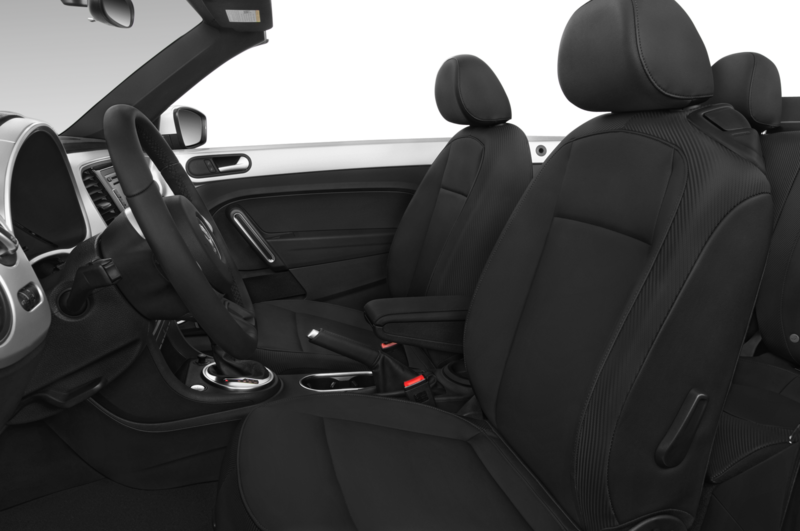 The interior gets a sporty boost as well, with new sport seats, and an assortment of trim finished in carbon-fiber style design. 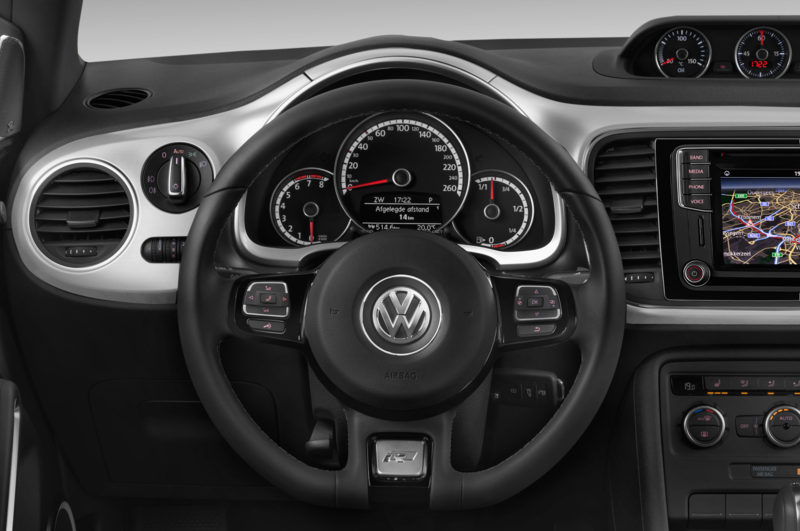 Finally, yellow gauges and stitching are spread out throughout the cabin as well. 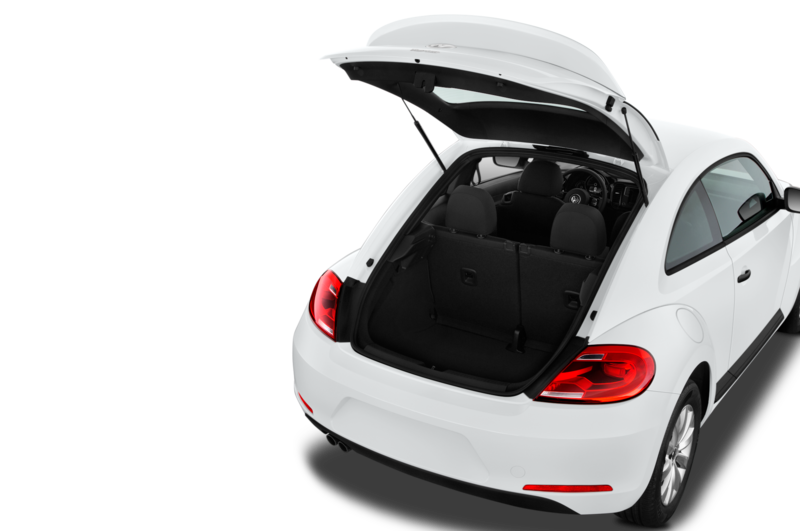 While there has been no official confirmation of production variants of these four Beetles, VW will measure feedback on the concepts at the official debut, and decide on their fate based on customer reaction. 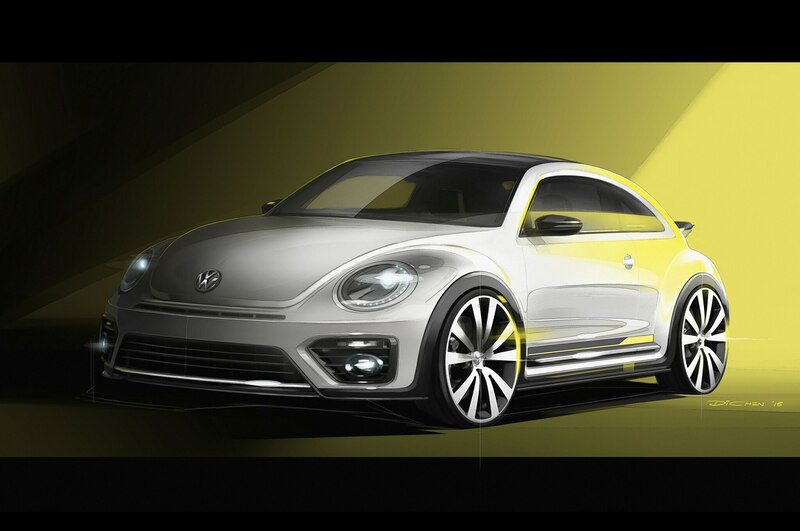 In the meantime, take a look at the four Beetle concepts in the gallery below. 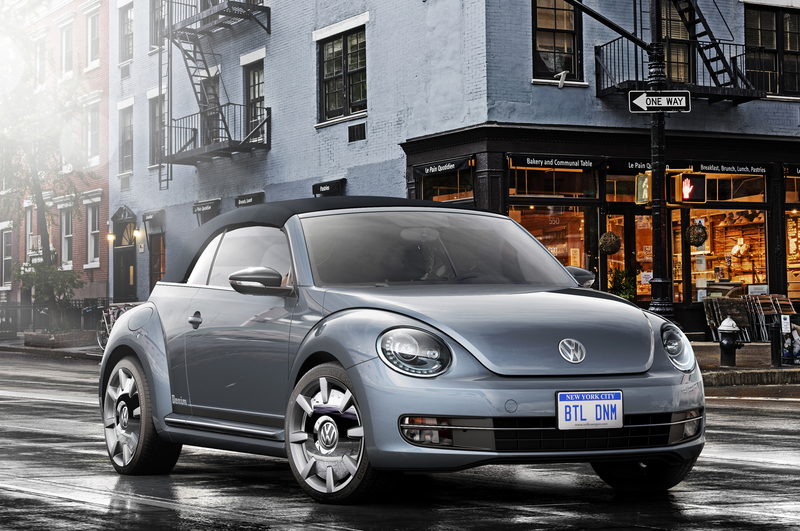 The Beetle that’s made from jeans. 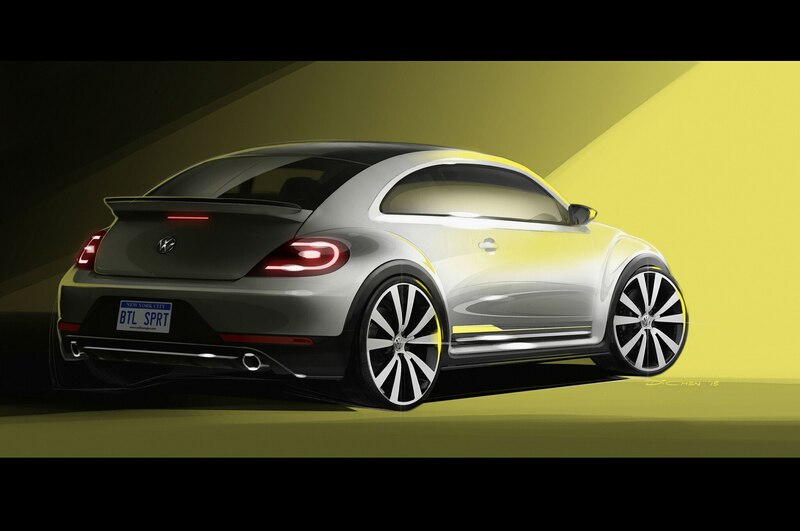 Baja Bug it ain’t, but still a cool update to the VW Beetle.